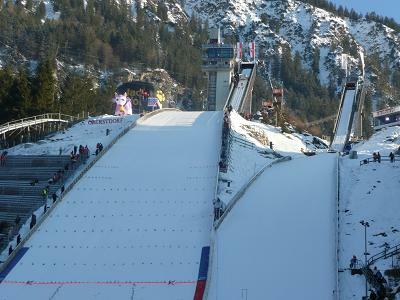 In 1909 Bruno Bieler from Freiburg jumped 22 metres on the first „large“ hill in Oberstdorf on the “Schanze auf den Halden” which was an outstanding performance at that time. 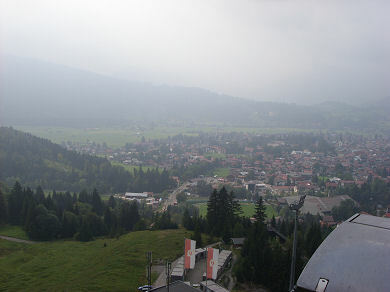 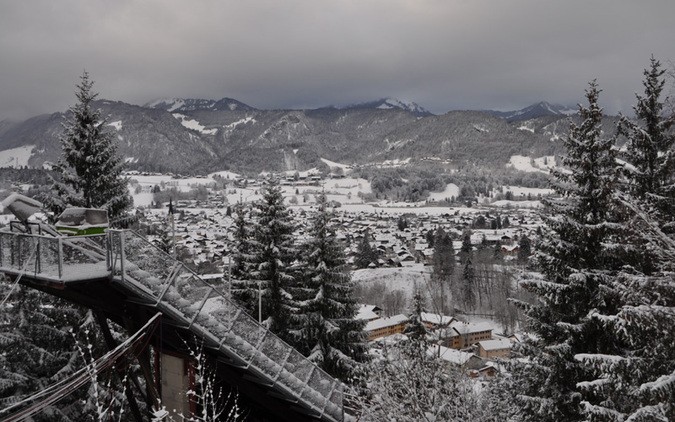 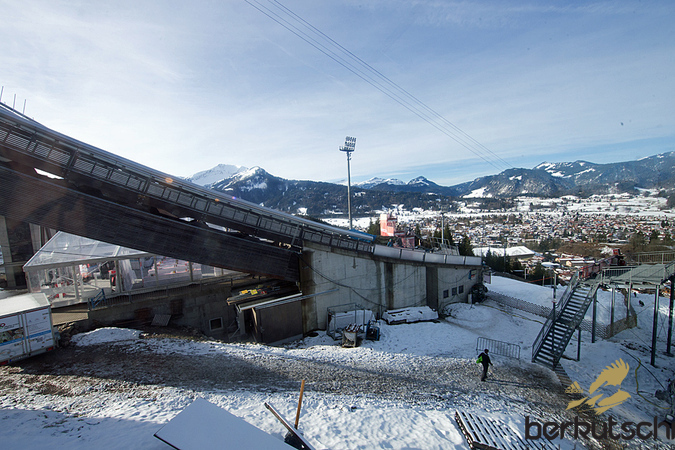 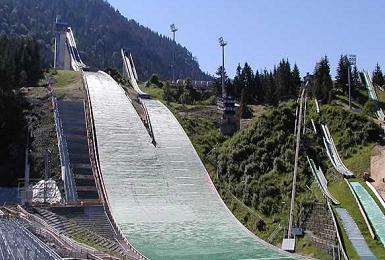 Oberstdorf was the place in Germany where ski jumping was most developed at that time. 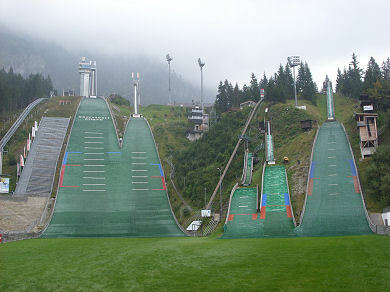 In order to form more good jumpers it was necessary to build larger ski jumping hills. 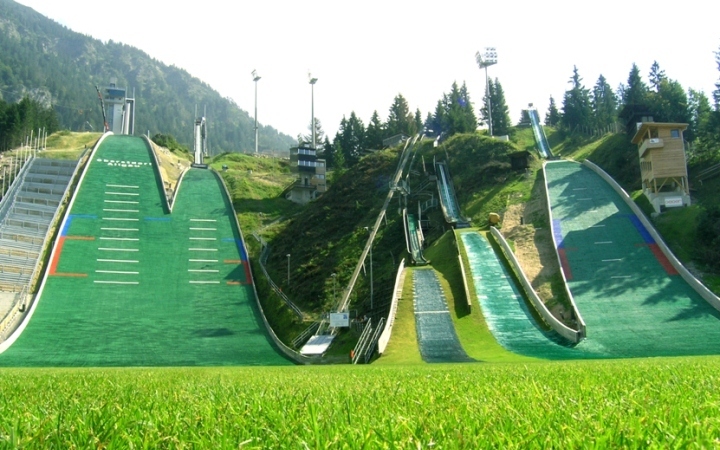 The jump in Karatsbichl got concurrency after the efforts made by the spa director Hermann Schallhammer to build in a better jump on Schattenberg, constructed by the architect Hans Gschwender. 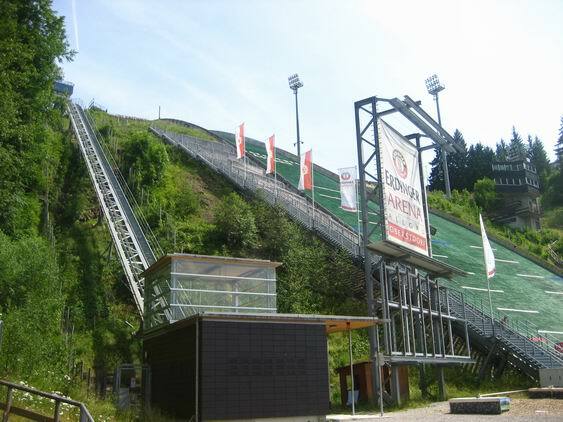 The hill was inaugurated on December 27, 1925 and later enlarged for hosting the German Championships in 1930 and the Olympic qualifiers in 1936. 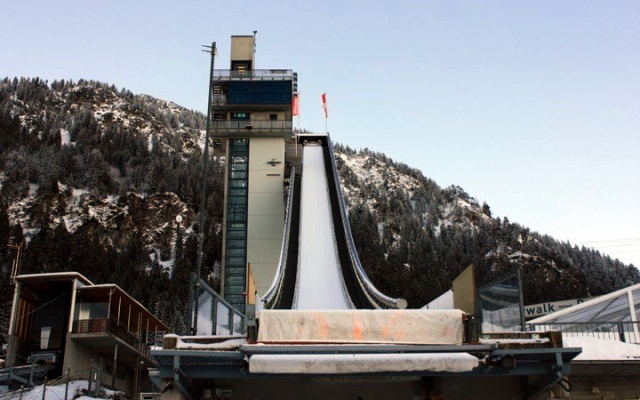 After World War II the "ski jumping trio of Oberstdorf", consisting of Heini Klopfer, Toni Brutscher and Sepp Weiler, immediately started to revive Schattenbergschanze and club activities of SC Oberstdorf swiftly re-gained momentum. 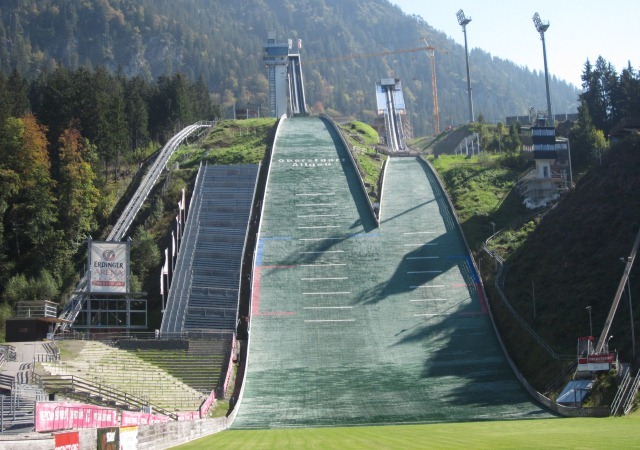 Already on January 1, 1946 the hill was reused for jumping and in 1949-50 it was reconstructed into a large hill according to plans made by Klopfer. 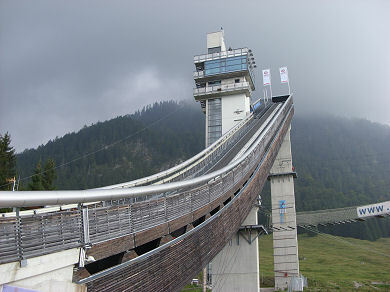 By 1950, the hill record was increased to 82 metres by Sepp Weiler. 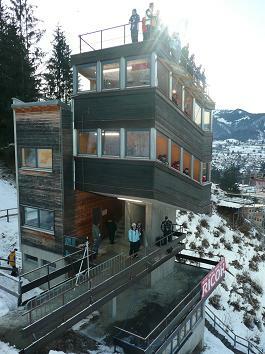 On January 4, 1953, Schattenbergschanze was hosting for the first time a competition of the newly established Four Hills Tournament. 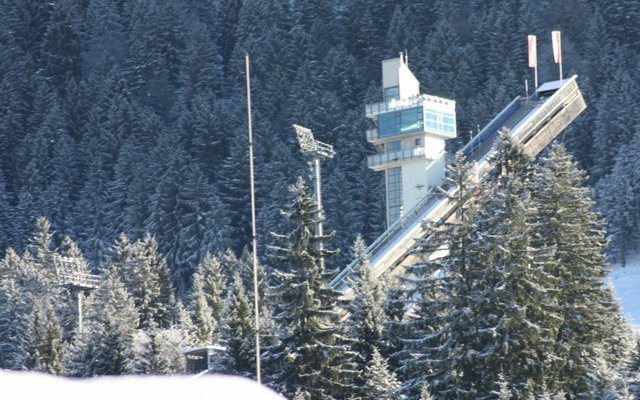 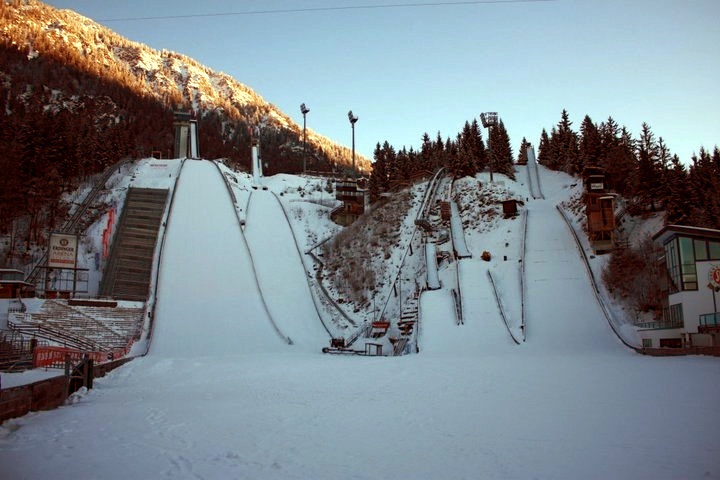 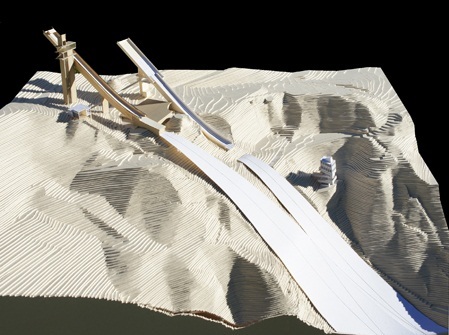 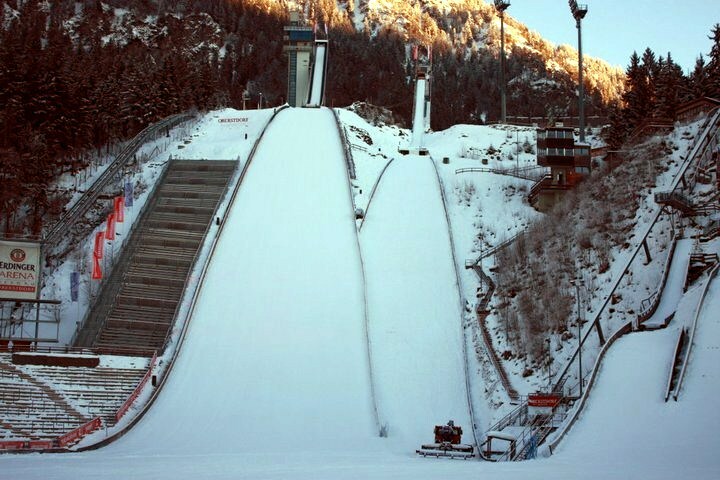 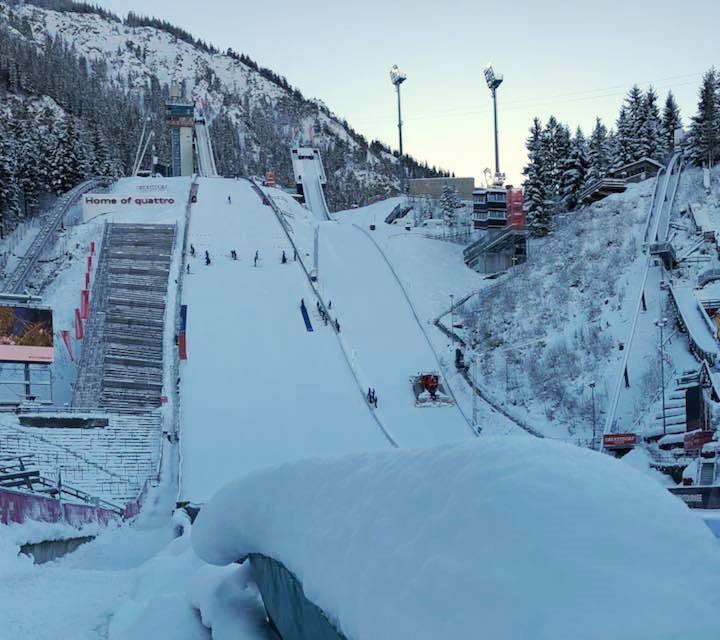 Though the wooden K70 hill had been continuously enlarged, it had become out-dated over the years and just in time four the Four Hills Tournament in 1972, a new, modern K110 hill with an inrun tower made from reinforced concrete was constructed beside. 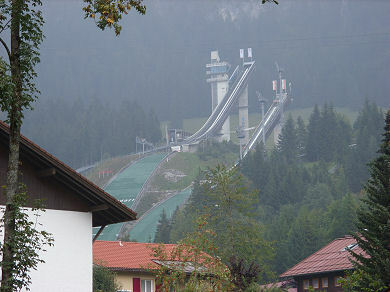 The hill was also supposed to act as a backup venue for the ski flying world championships in 1973. 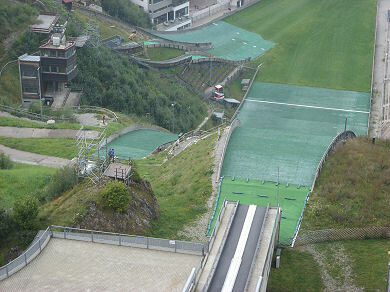 Around the same time, the plastic covered K56 practicing hill was built and opened in 1974. 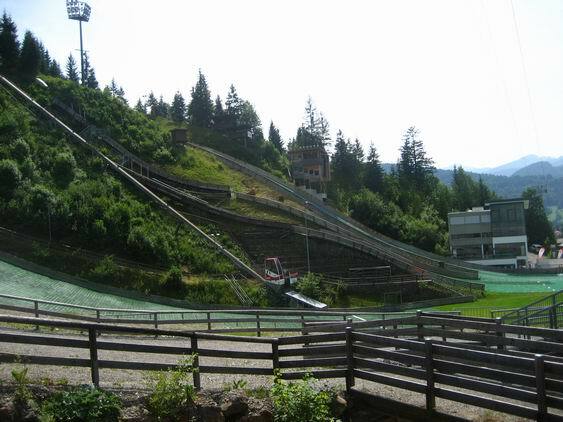 Furthermore, in 1978-79 also the 70 meter normal hill was modernized as K85. 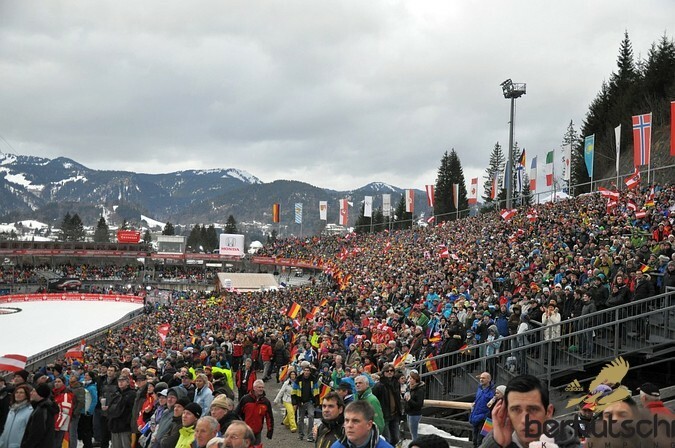 In 1987 the Schattenberg ski stadium was host of Nordic Ski World Championships with enormous accounts of ten thousands of spectators. 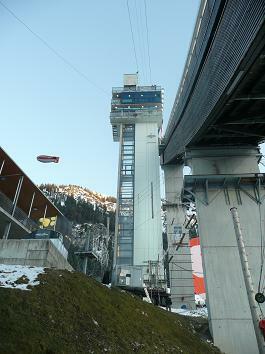 Therefore, the normal hill was re-constructed as K90 with a reinforced concrete inrun tower. 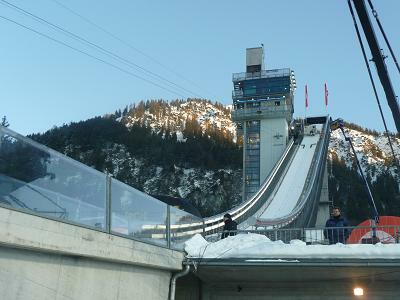 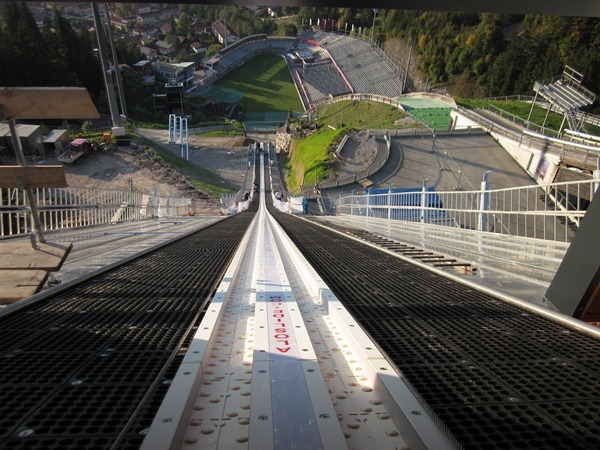 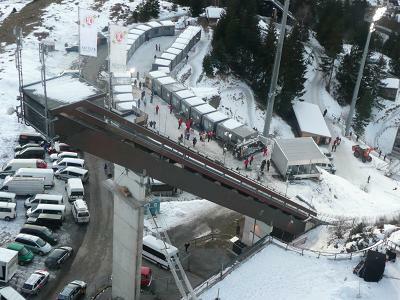 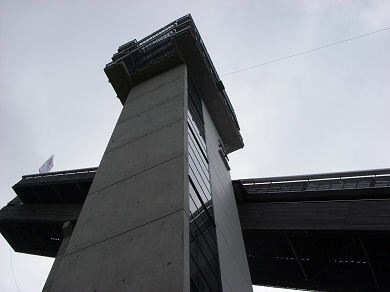 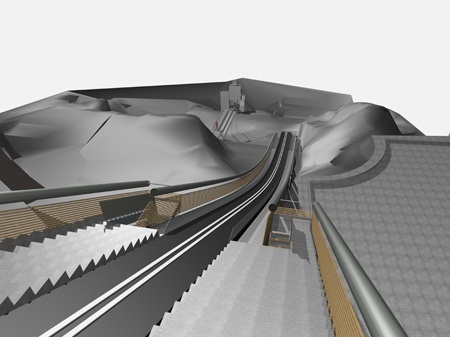 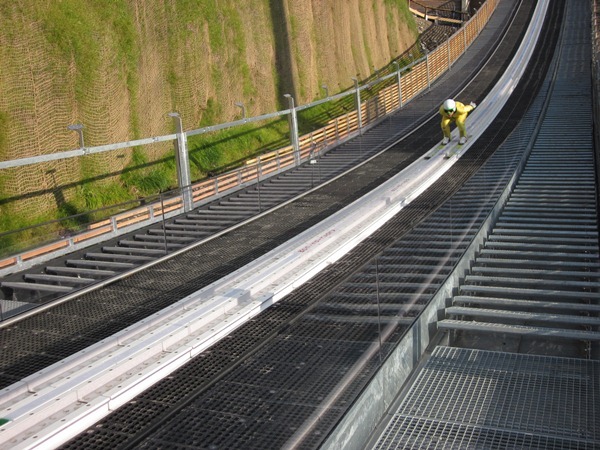 Further changes to the ski jumping facility were made in 1997, when the inclined elevator was built and the junior hills K30 and K20 were added. 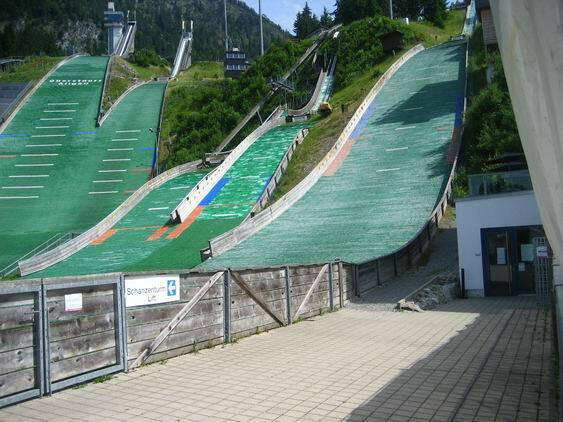 Then, Ski-Club Oberstdorf was again awarded to host the Nordic World Championships in 2005. 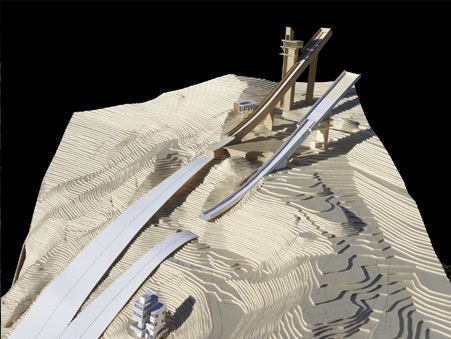 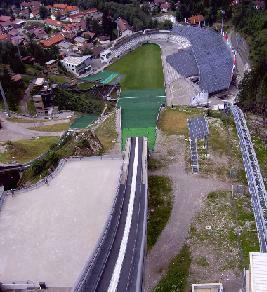 Therefore, the ski jumping facility was fundamentally modernized for 16.6m Euro in 2002. 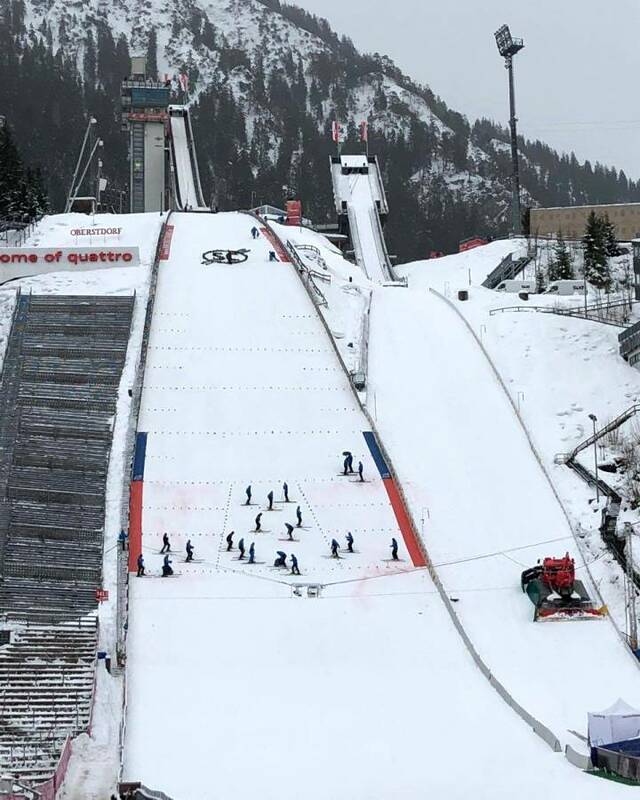 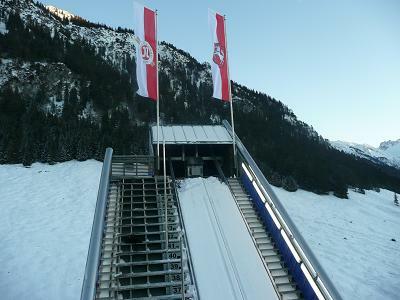 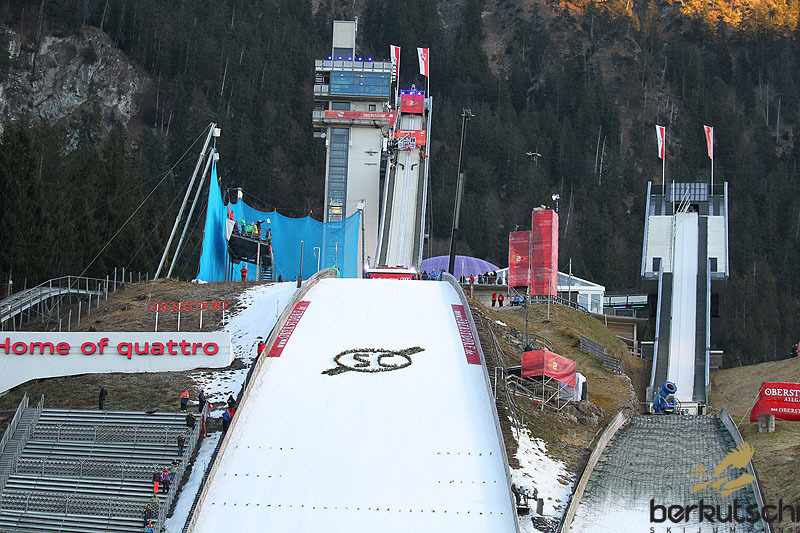 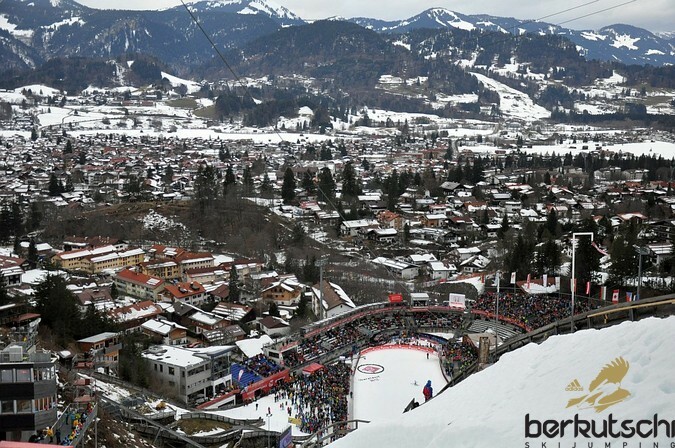 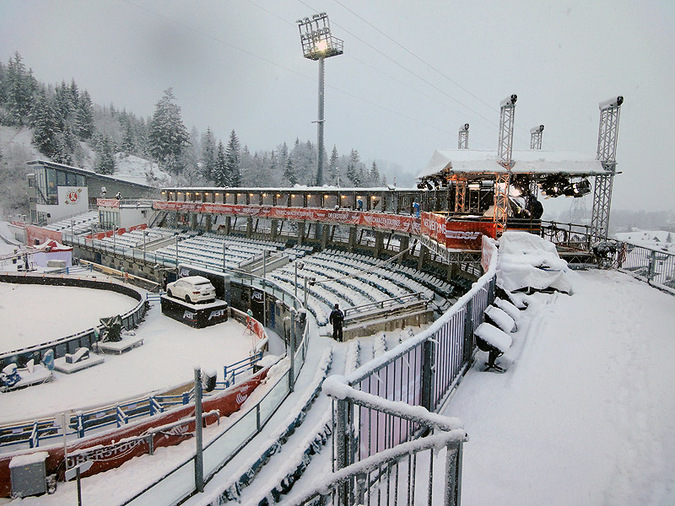 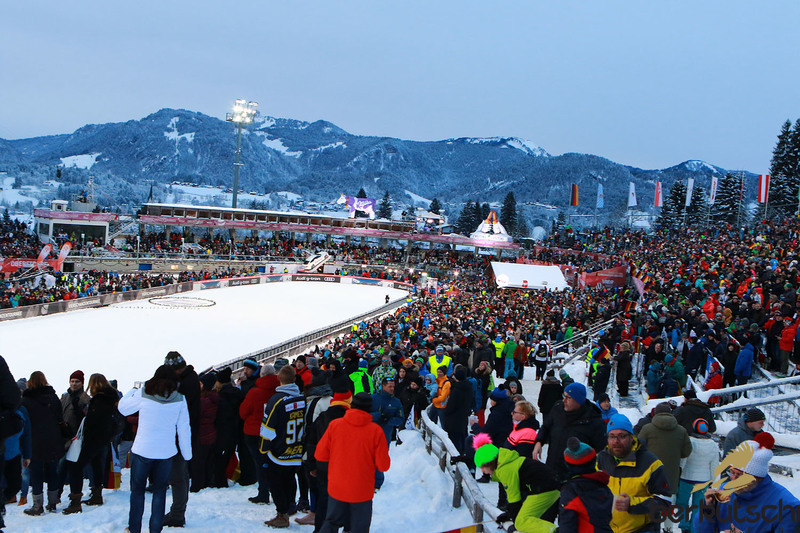 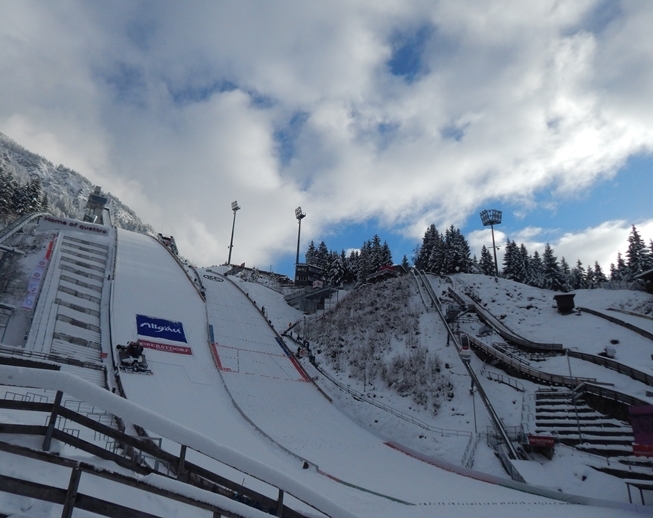 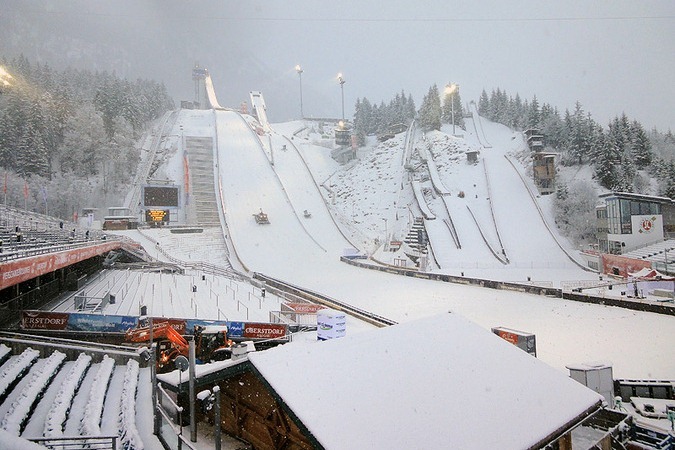 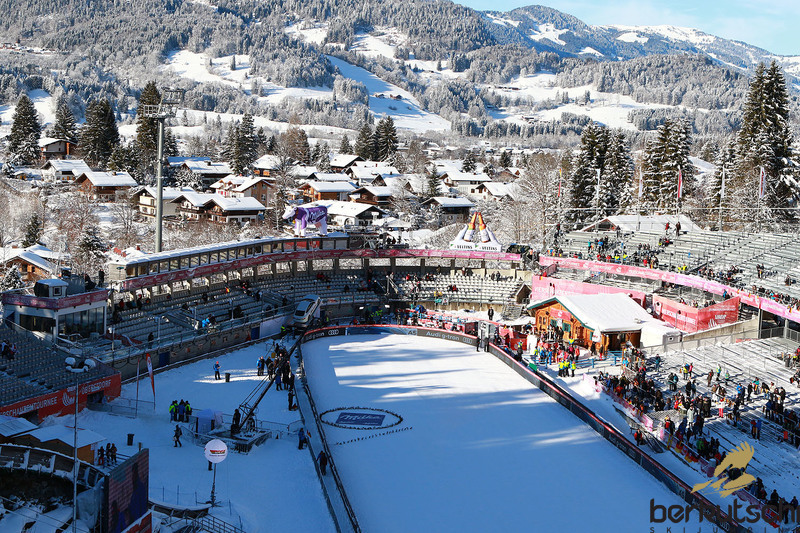 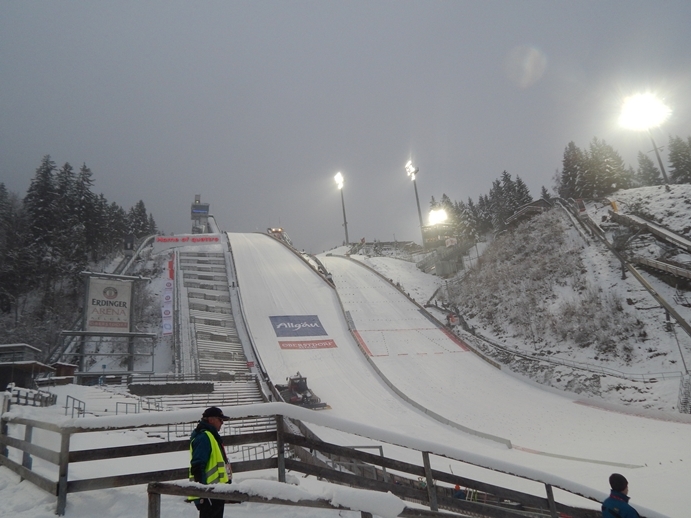 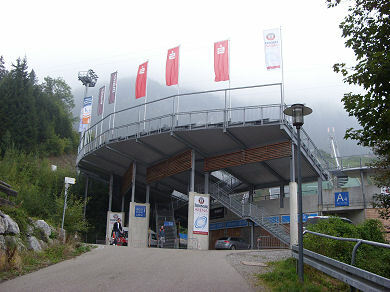 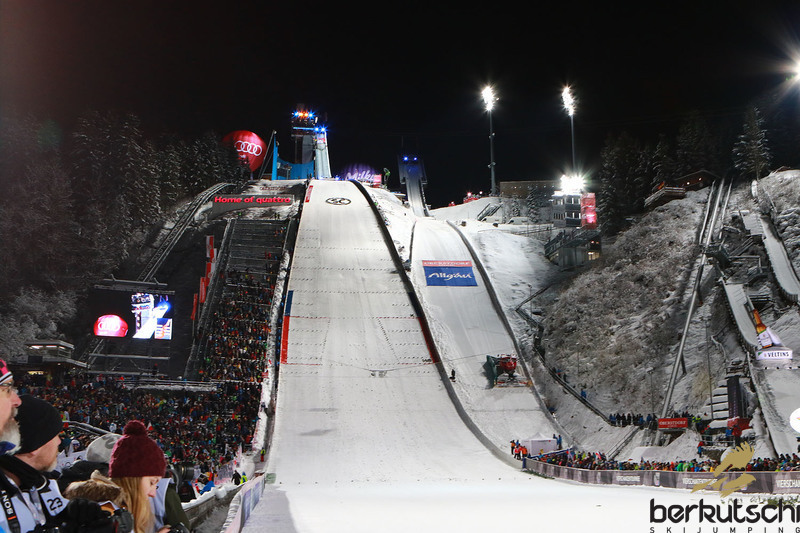 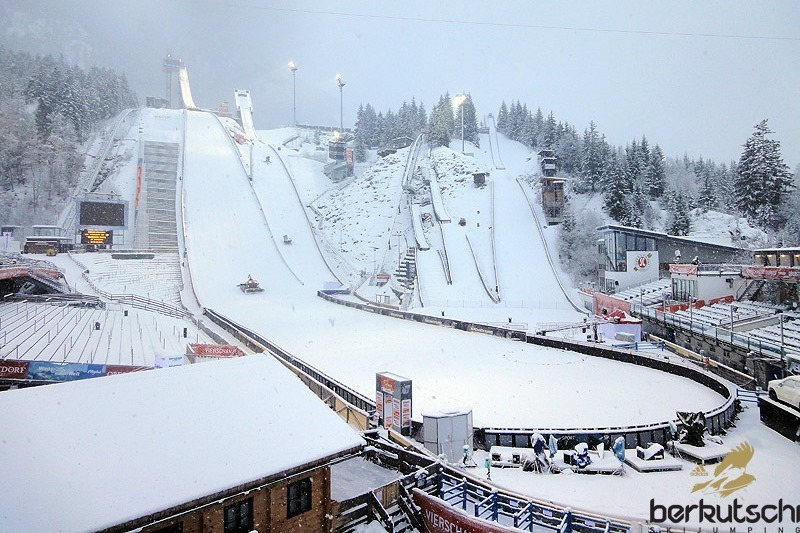 Since the inauguration with the Four Hills Tournament competition in 2003, the arena of Oberstdorf consists of the Schattenbergschanzen K120, K90, K56, K30 and K19. 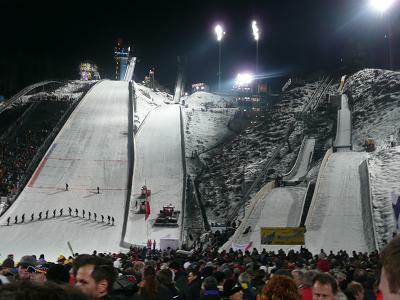 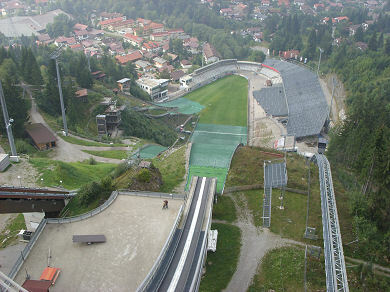 Beside the ski jumping hills, also general infrastructure was improved by constructing two lifts and a world wide unique spectator stand which can host up to 24,000 spectators. 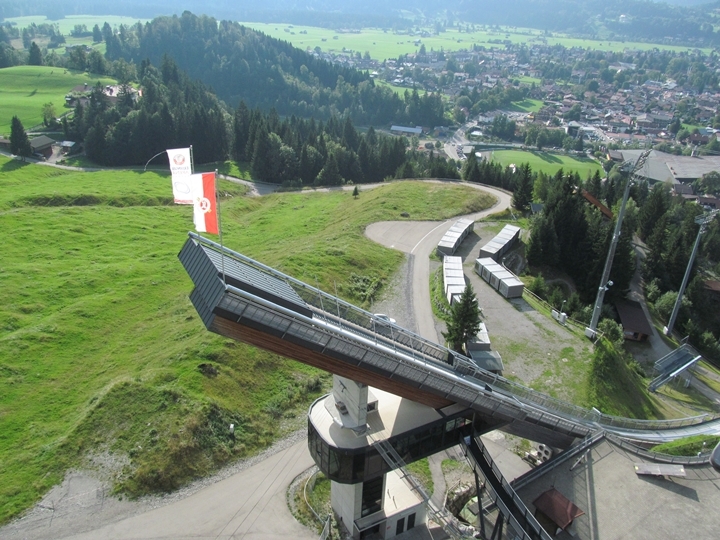 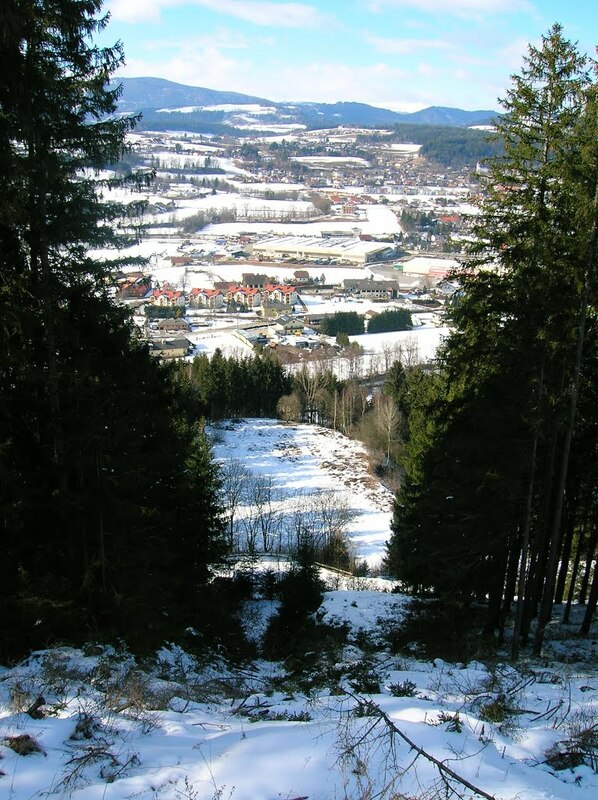 In spring 2011 the around 4.7m Euro expensive modernization of the normal hill had started. 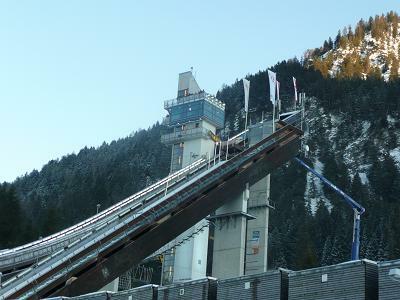 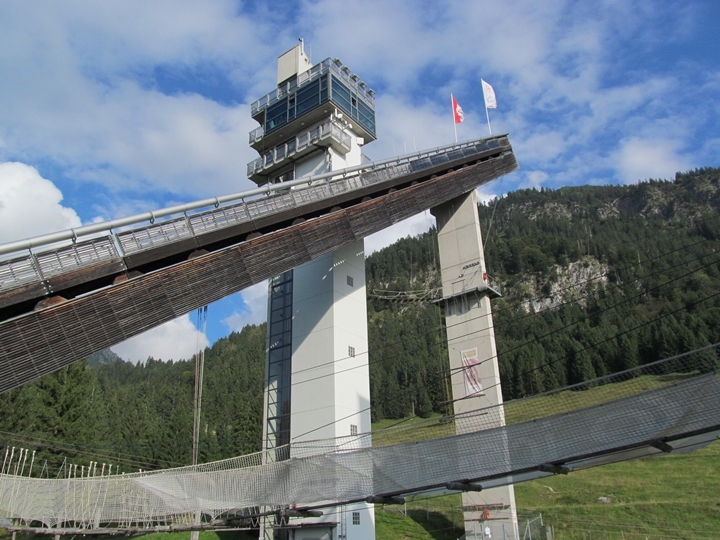 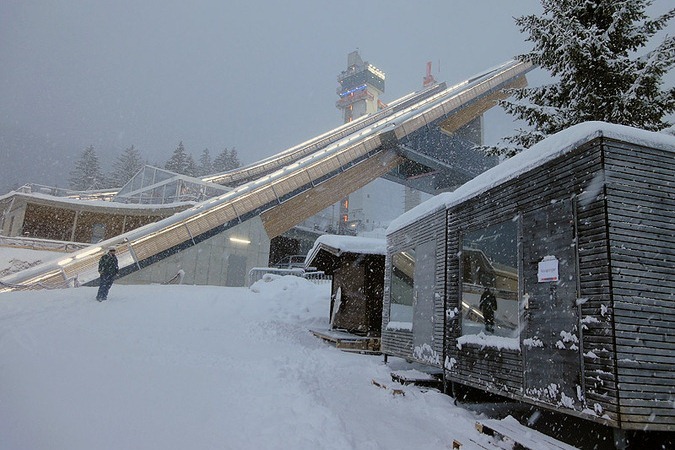 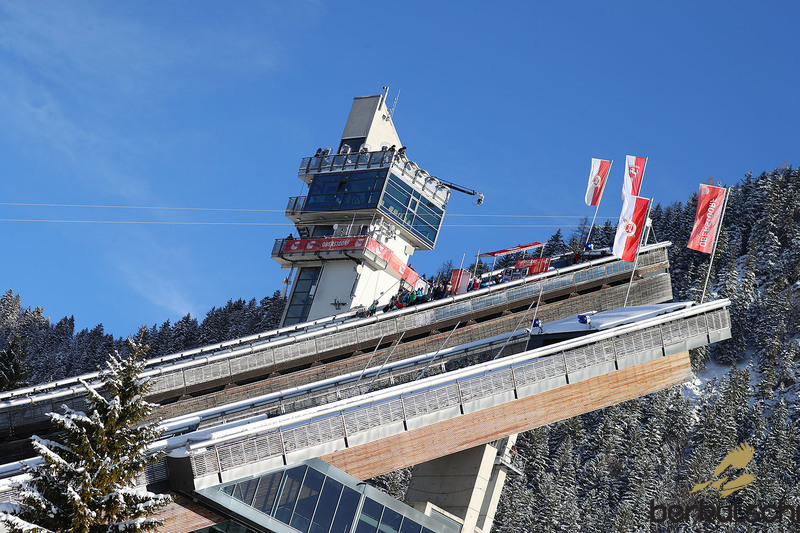 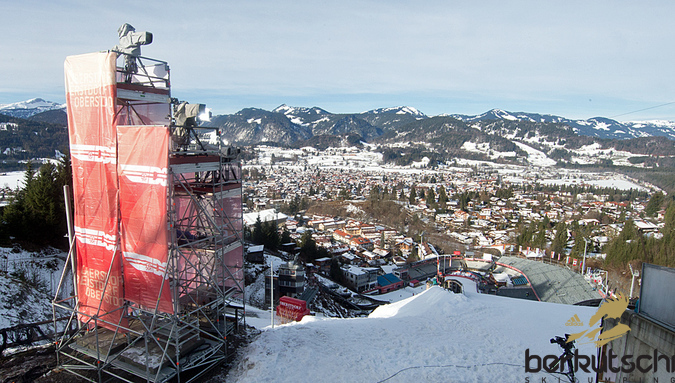 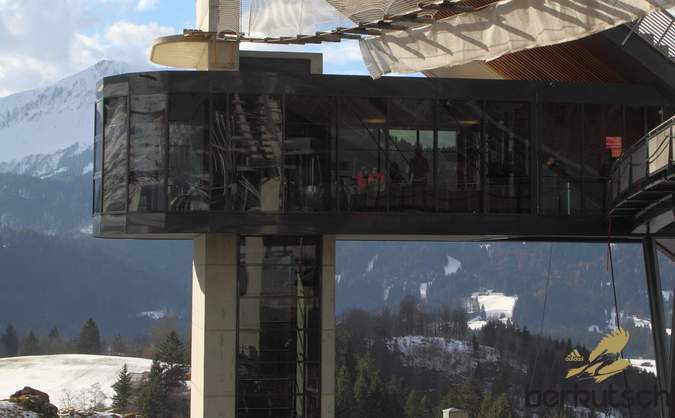 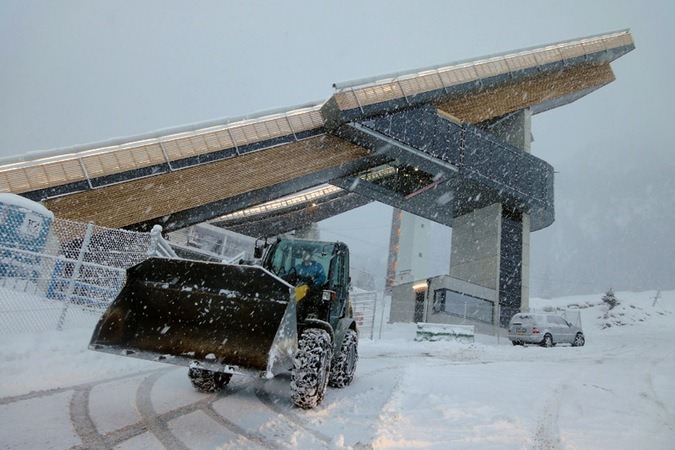 The 30 year old inrun tower of K90 was torn down and replaced by a new one, which was moved backwards by 6.2 m. The new K95 / HS 106 ski jump was completed in November 2011. 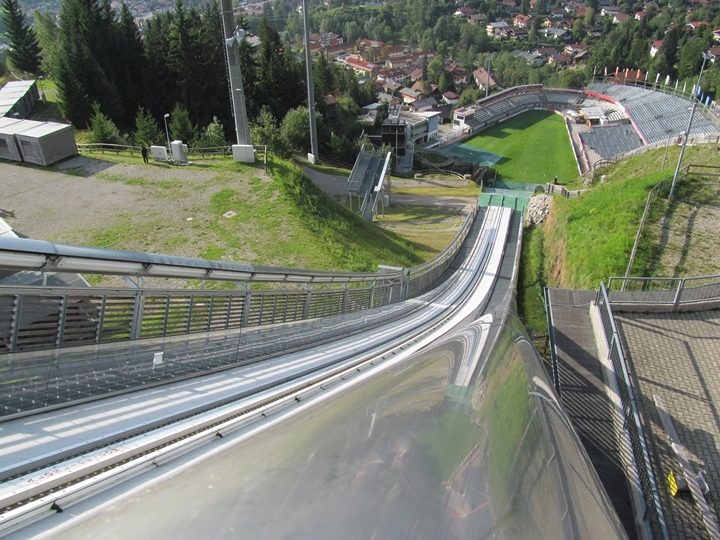 Furthermore, the K57 hill was modernized in 2015 and its decades old inrun had been renewed. 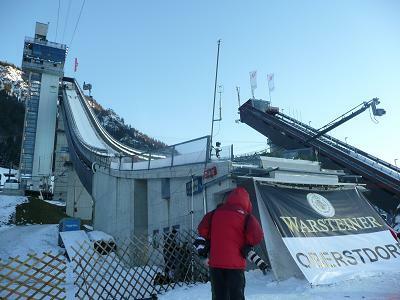 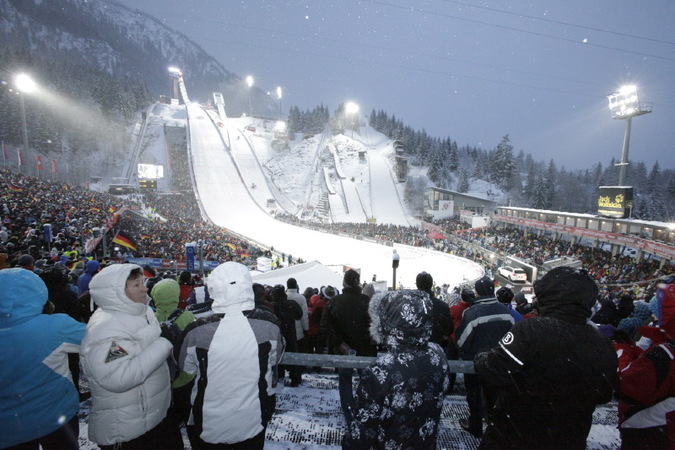 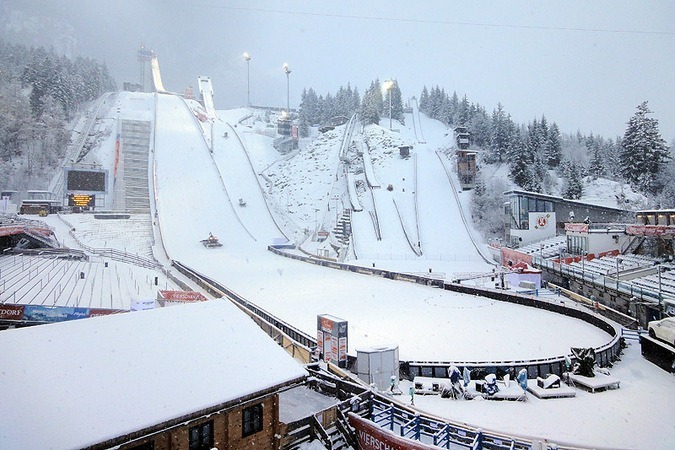 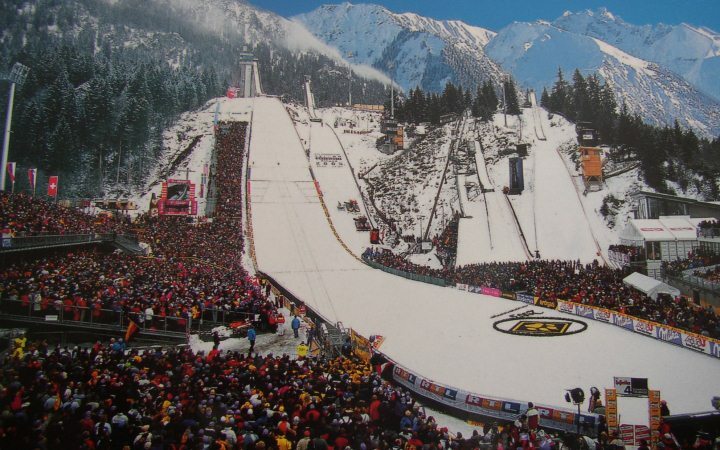 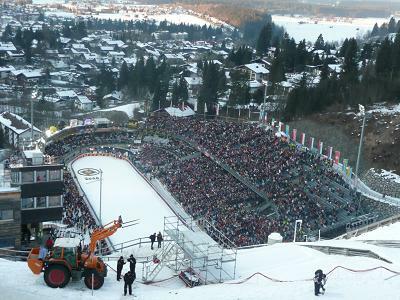 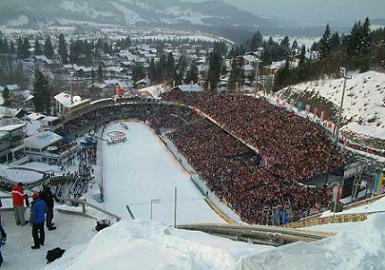 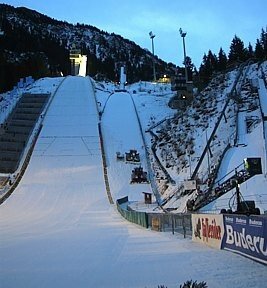 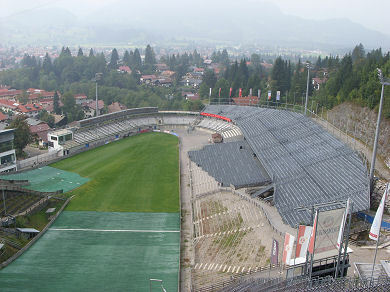 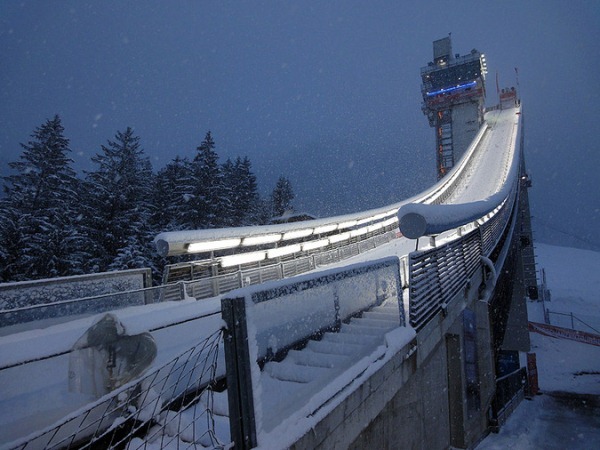 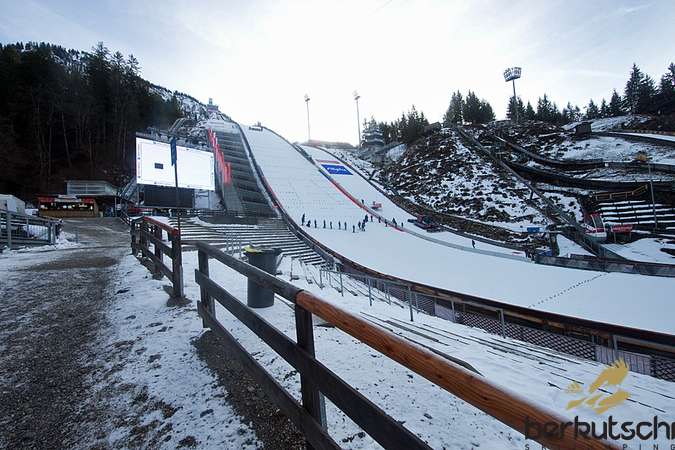 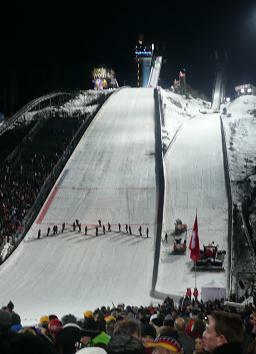 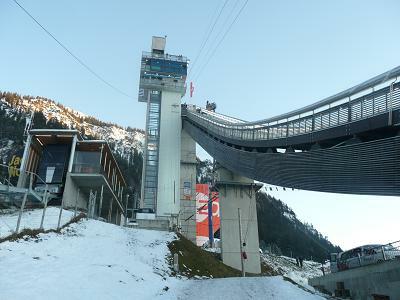 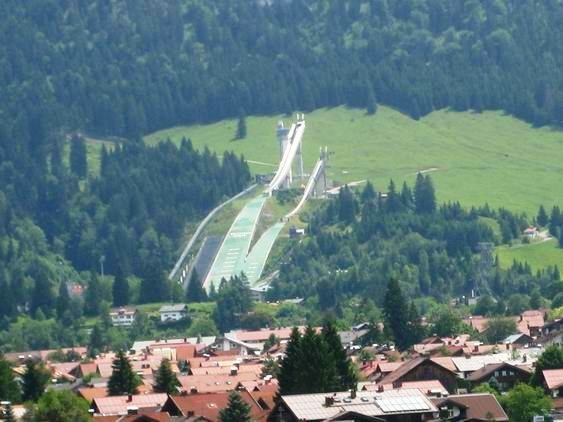 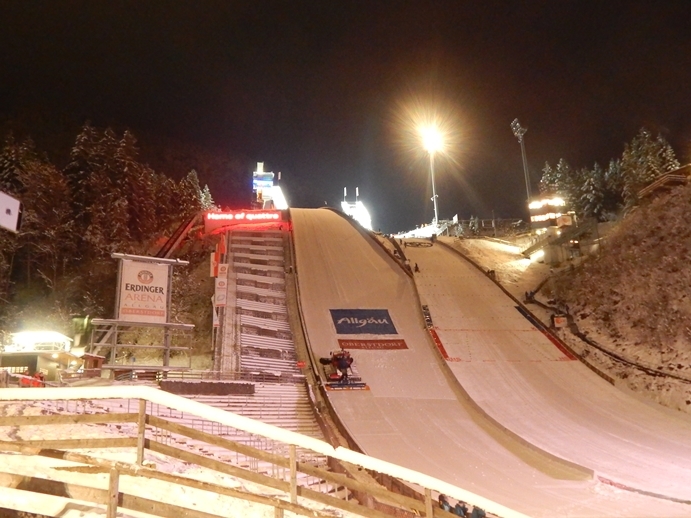 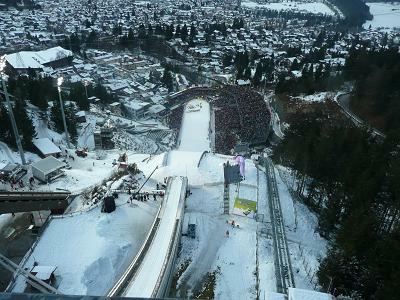 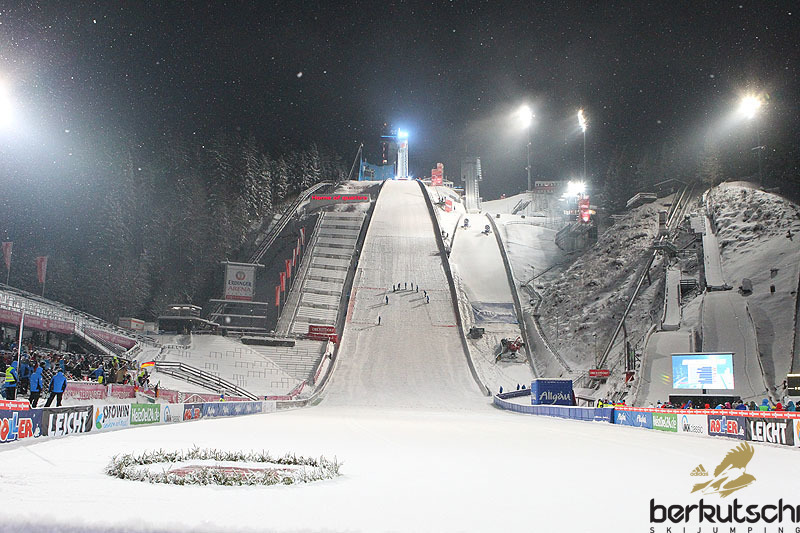 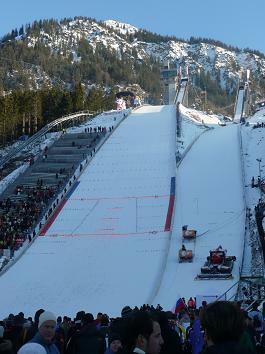 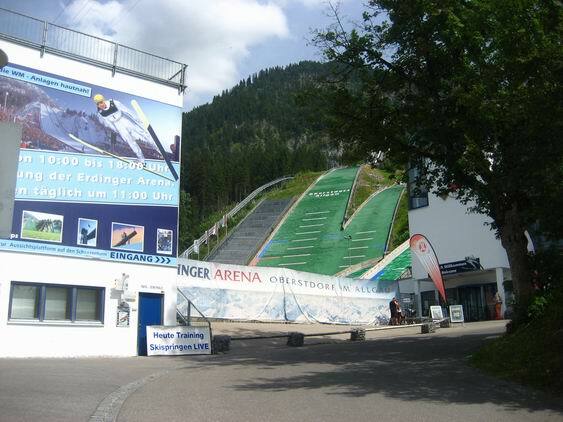 Since December 2004, the Schattenberg ski jumping stadium had been officially called "Erdinger Arena". 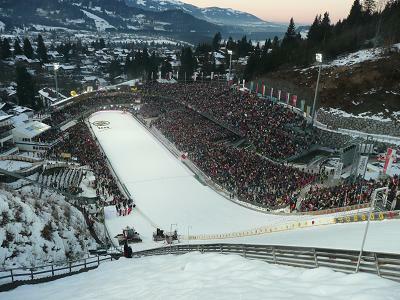 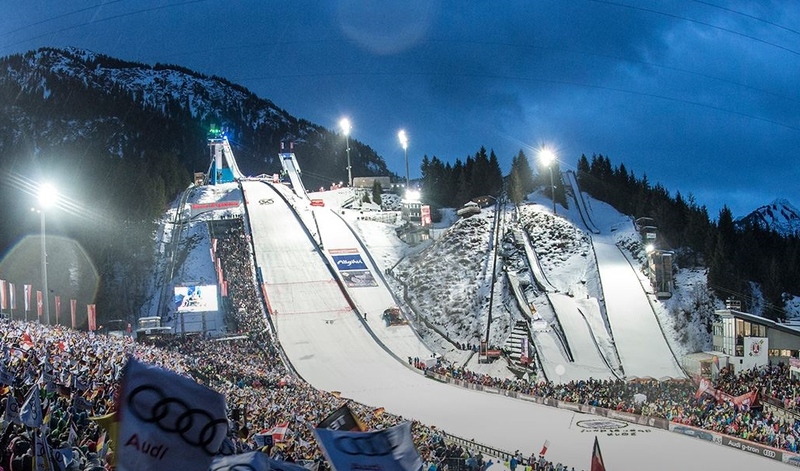 In December 2017, the title sponsor and name have changed to "Audi Arena Oberstdorf". 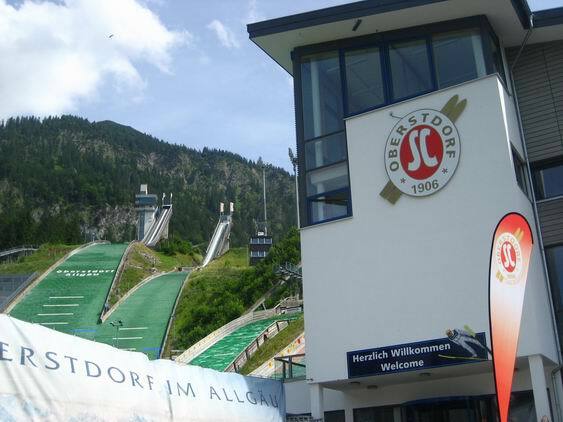 Oberstdorf is in the Allgaeu about 40 km south of Kempten and east of Bregenz. 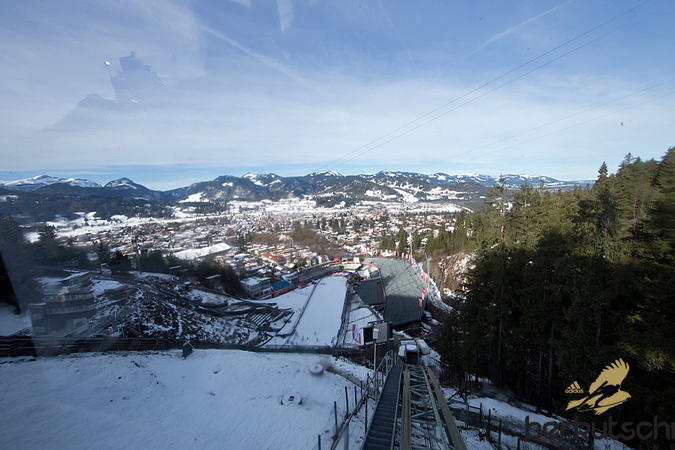 The highest peak near Oberstdorf is the Nebelhorn and the Austrian border is only 4 km away. 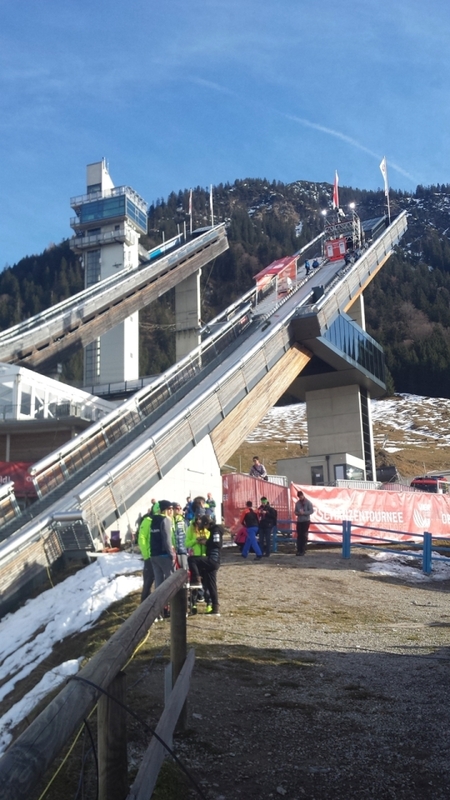 Just in time for the comeback of the ski flying in Oberstdorf, skijumpinghills.com presents the second part of columnist Luis Holuch's visit in Oberstdorf! 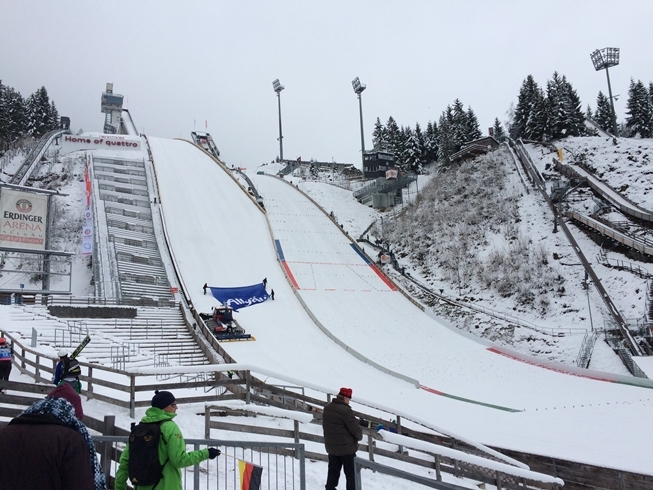 In this episode, Luis tells about his experiences in the Erdinger Arena, his visit of the renovated Heini-Klopfer-ski-flying-hill and which female ski jumper could possibly become the seventh woman on a ski flying hill. 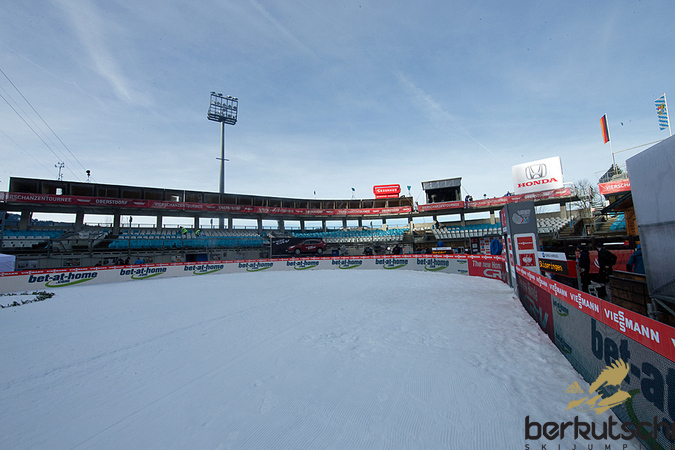 As always, we wish you a lot of fun at reading and are looking forward to your feedback! 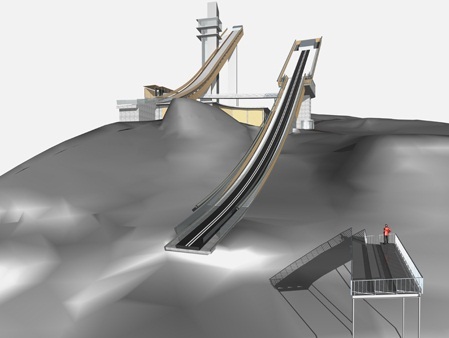 The 49th FIS Congress in Barcelona has already started and on Thursday the decision on the host of the Nordic World Ski Championships 2019 is to be made. 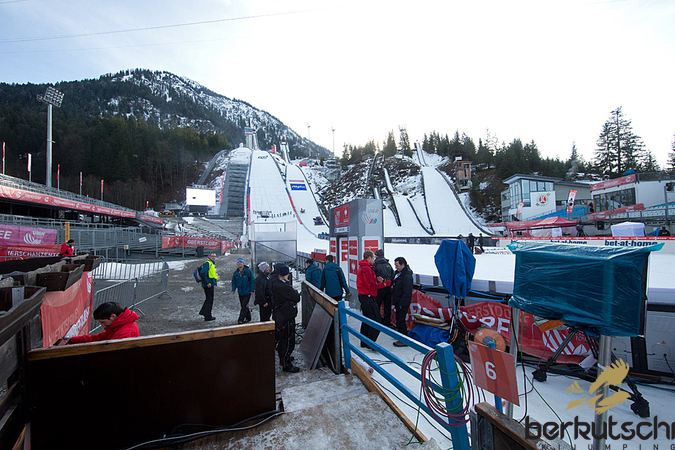 We shortly present the candidates Almaty, Oberstdorf, Planica and Seefeld. 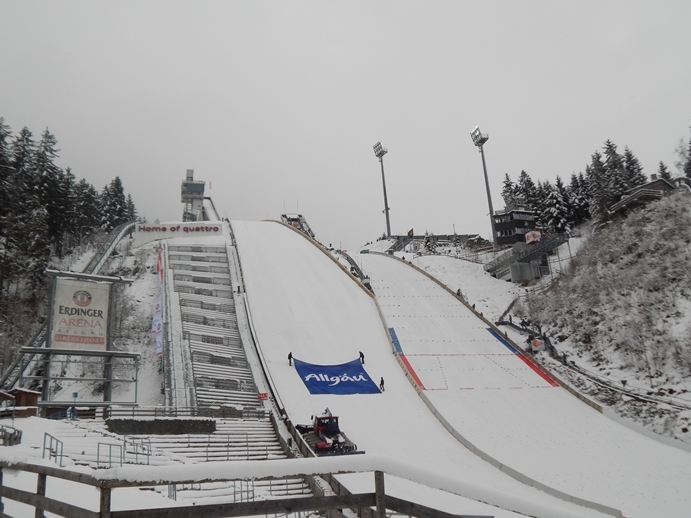 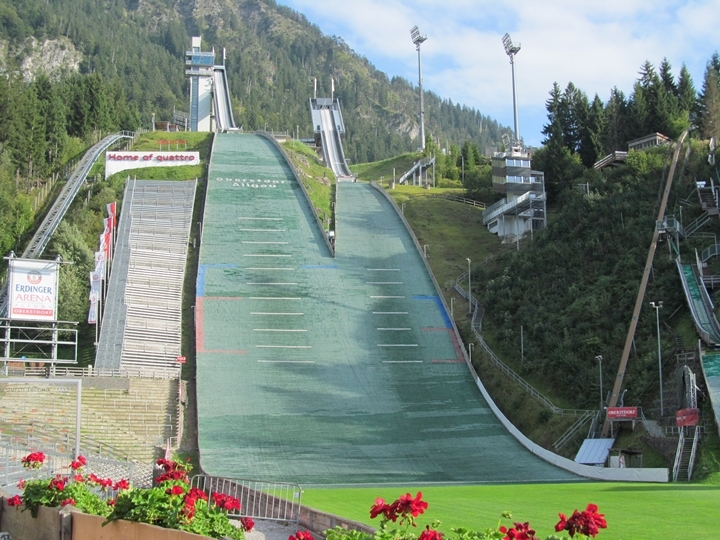 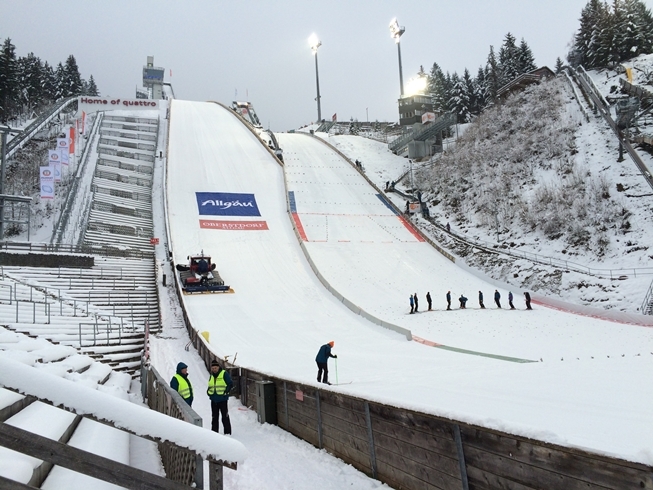 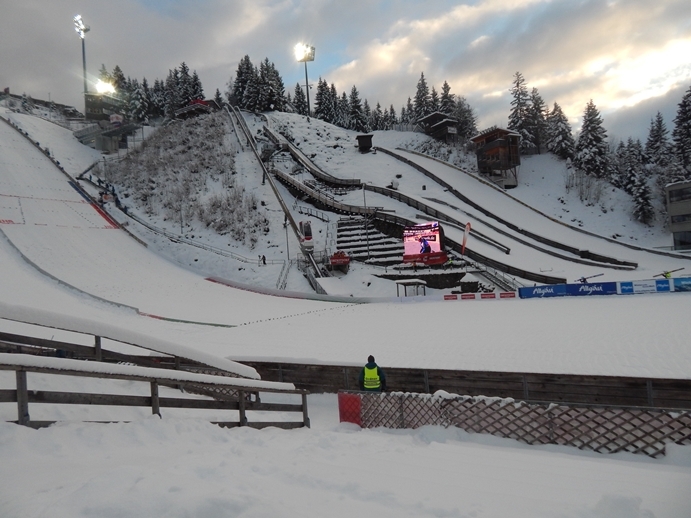 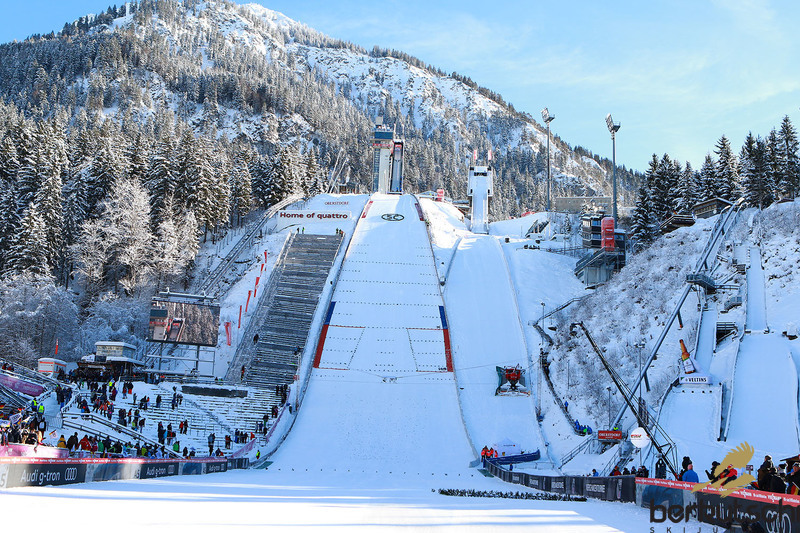 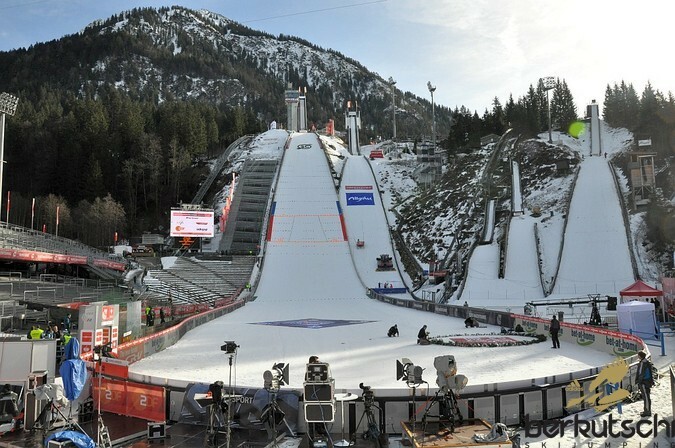 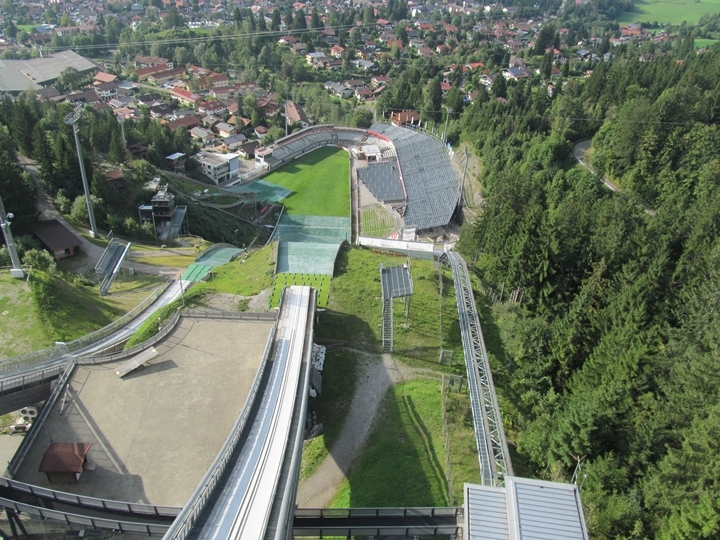 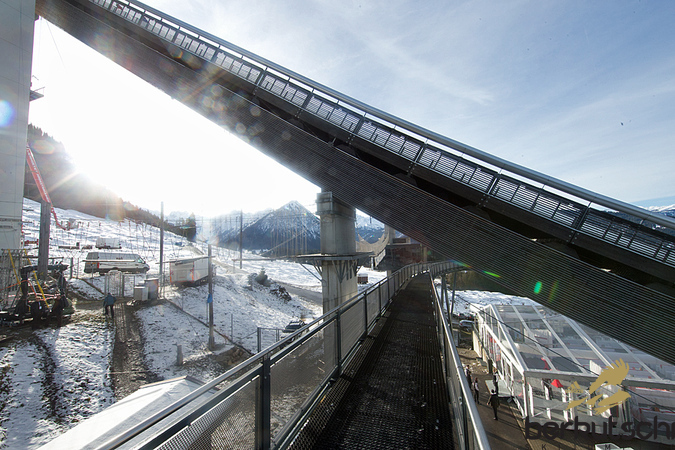 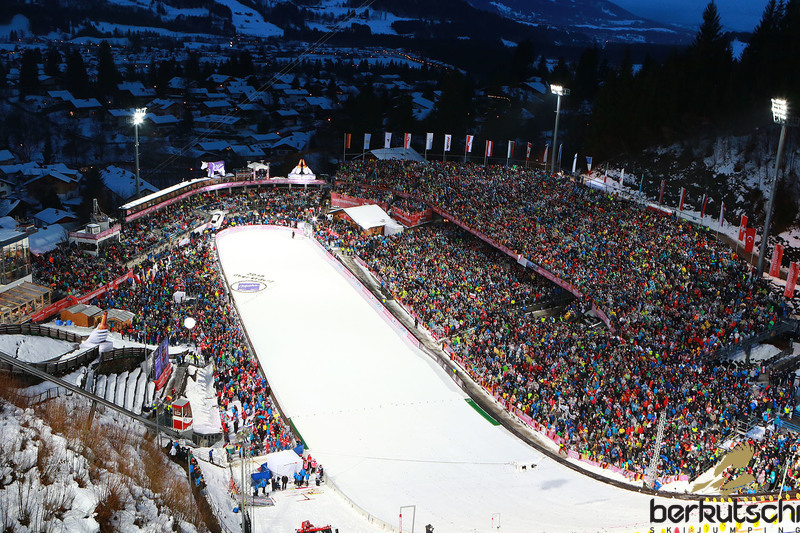 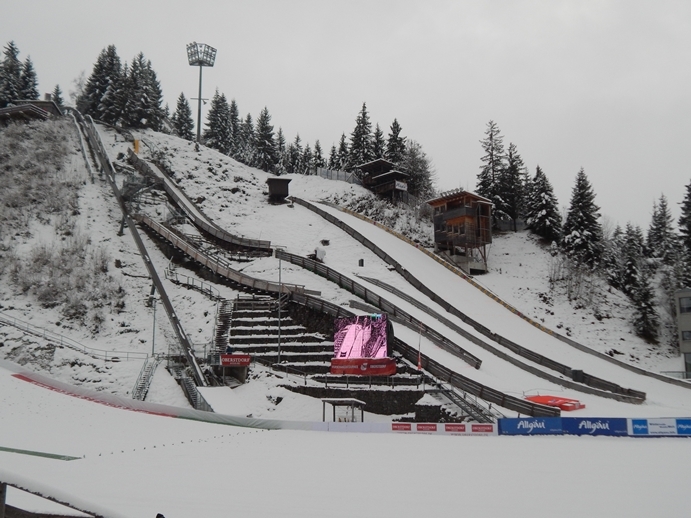 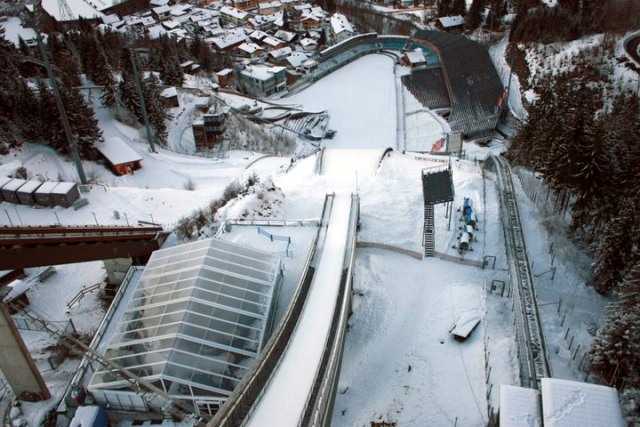 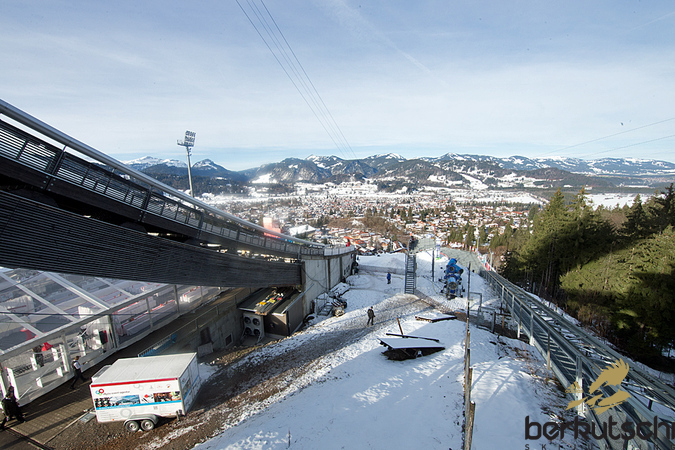 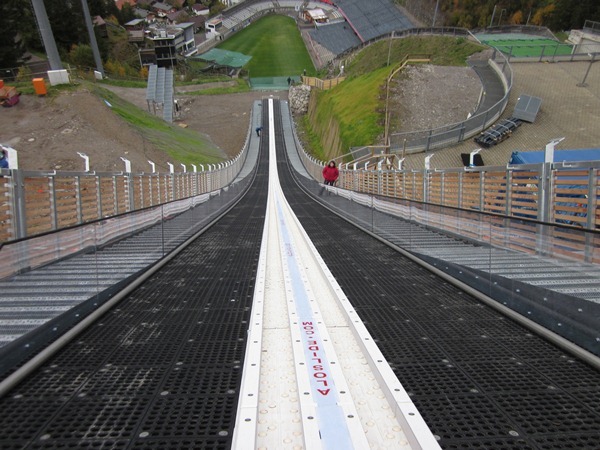 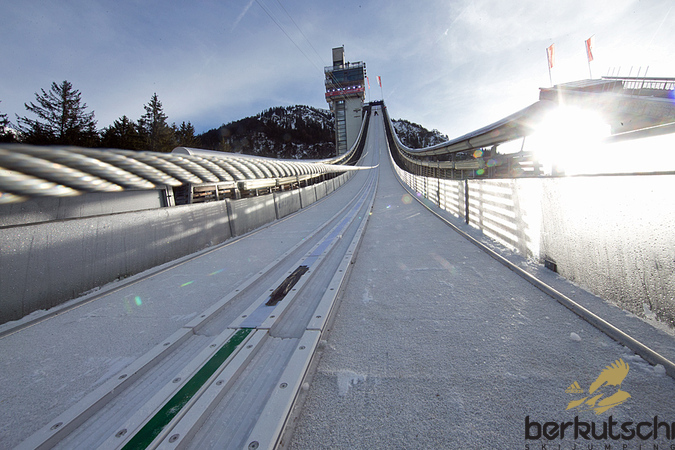 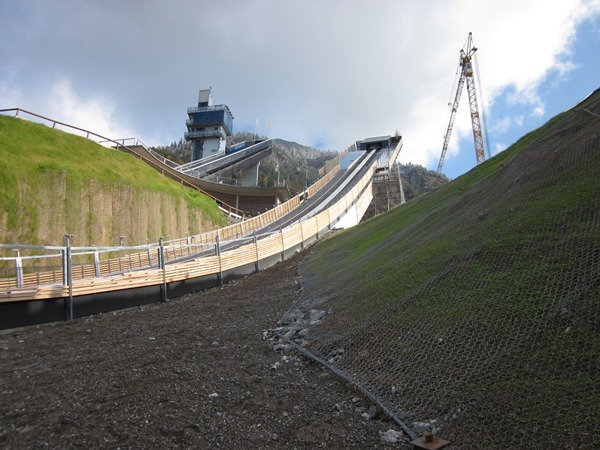 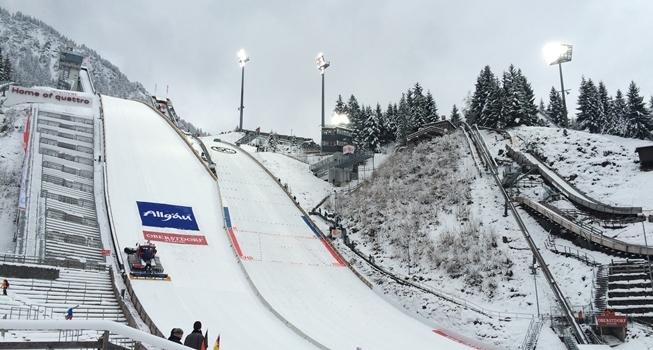 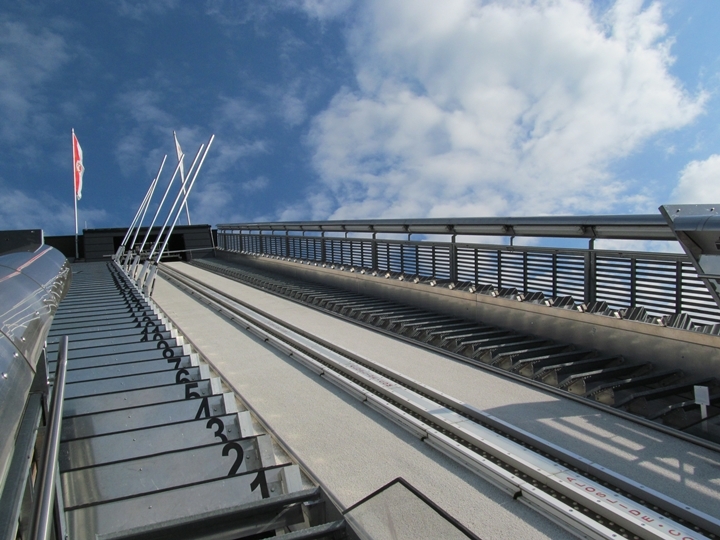 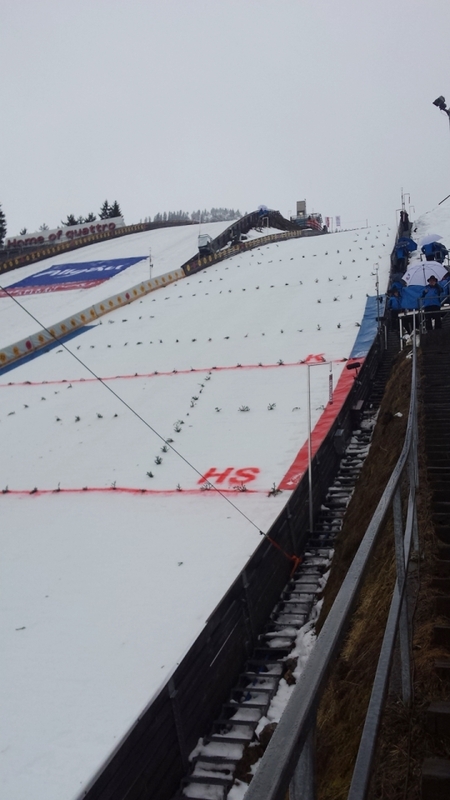 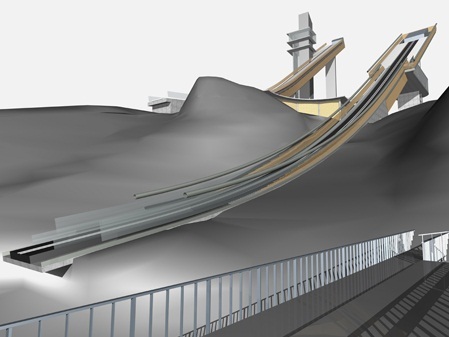 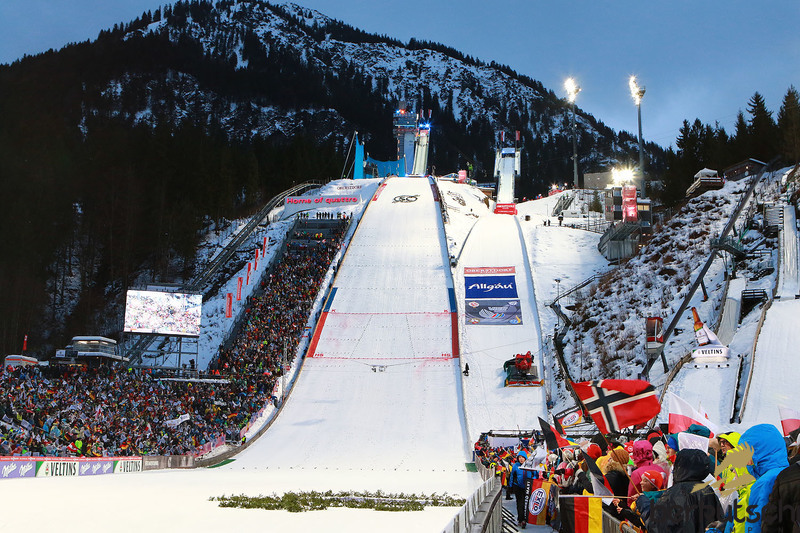 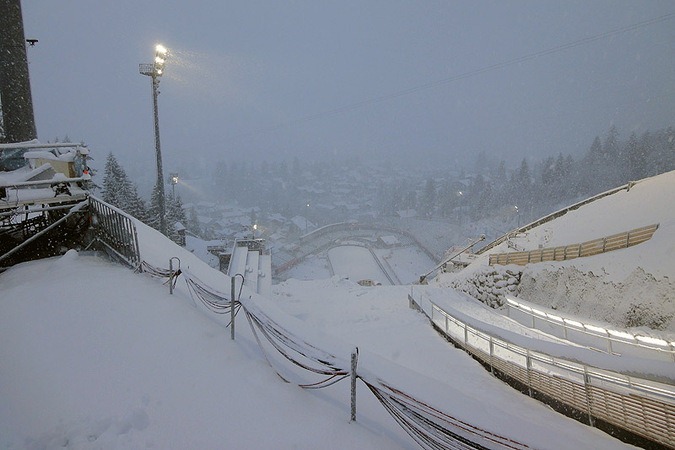 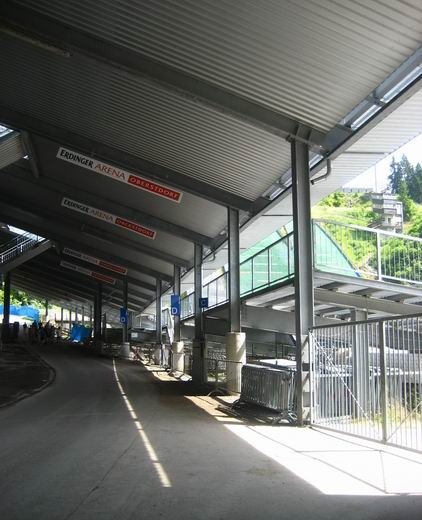 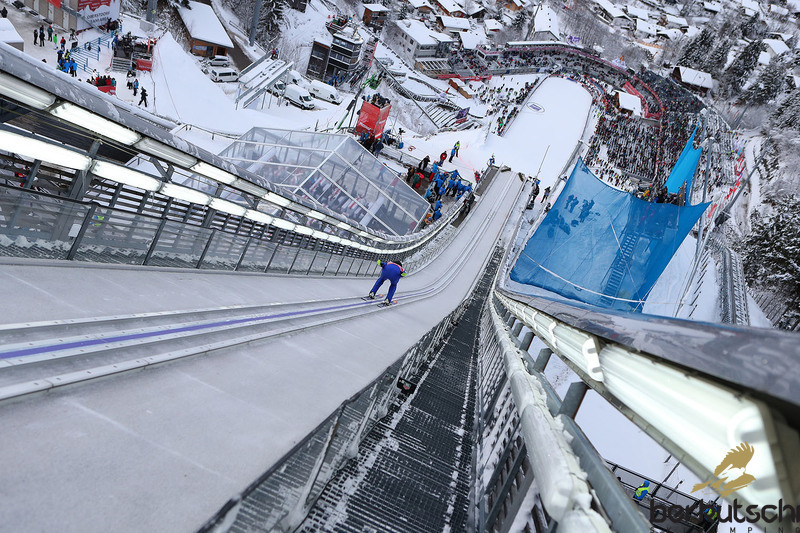 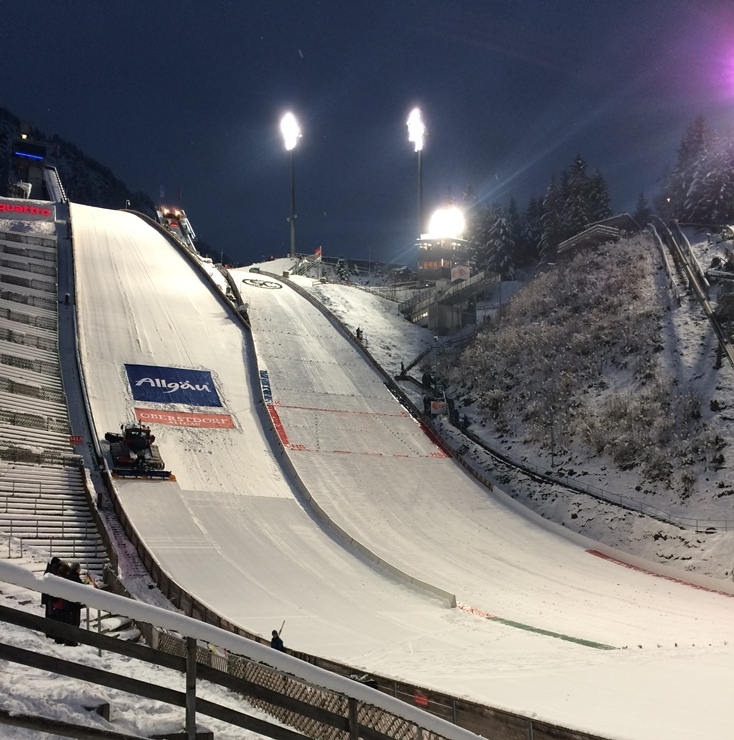 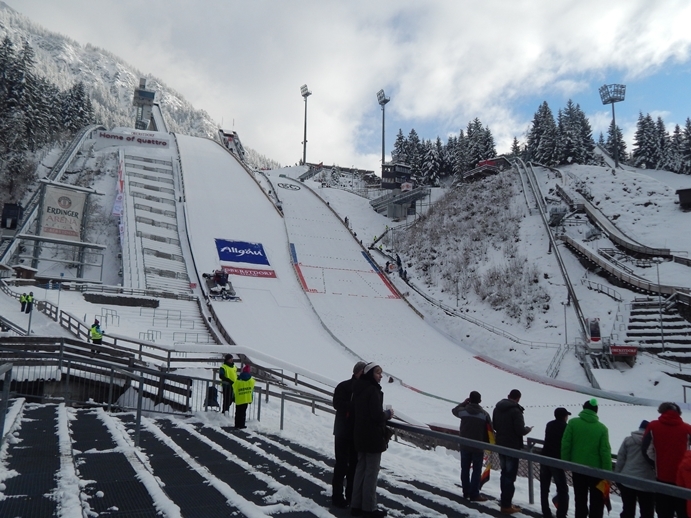 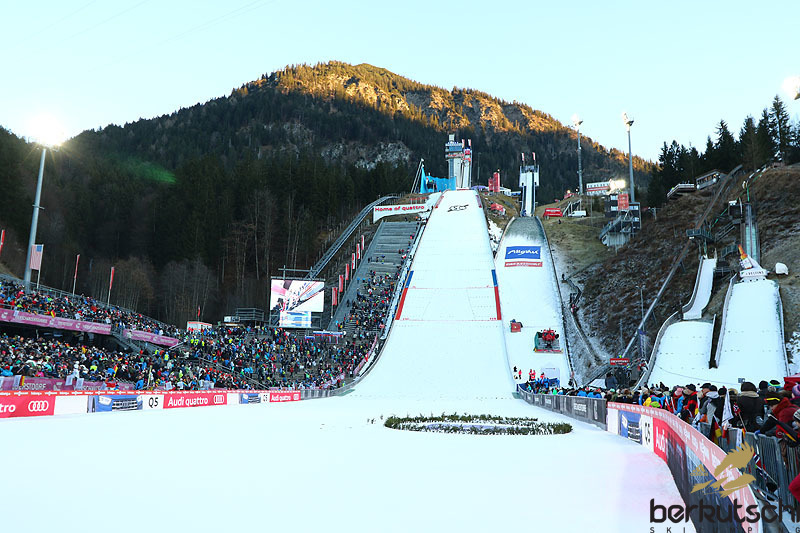 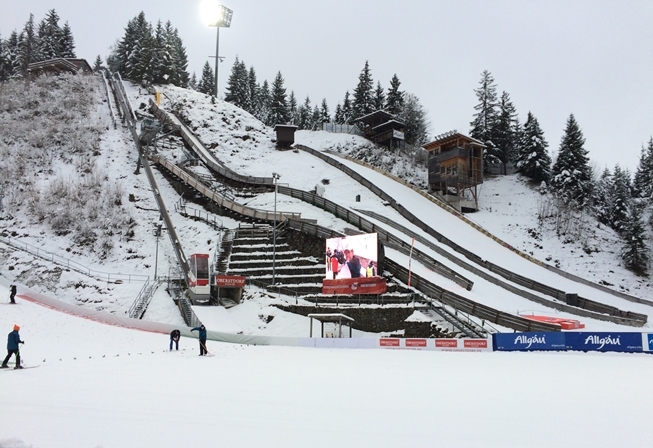 In the past months a new ALOSLIDE ICE inrun track had been installed on the HS 137 ski jumping hill at Erdinger Arena Oberstdorf. 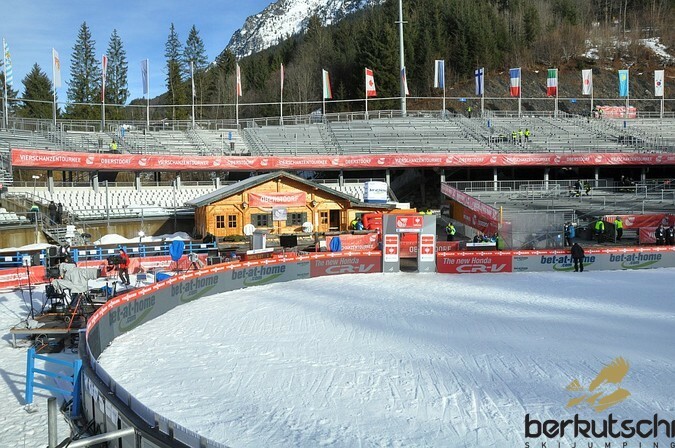 Cooled ice tracks are mandatory from the next World Cup winter season onwards. 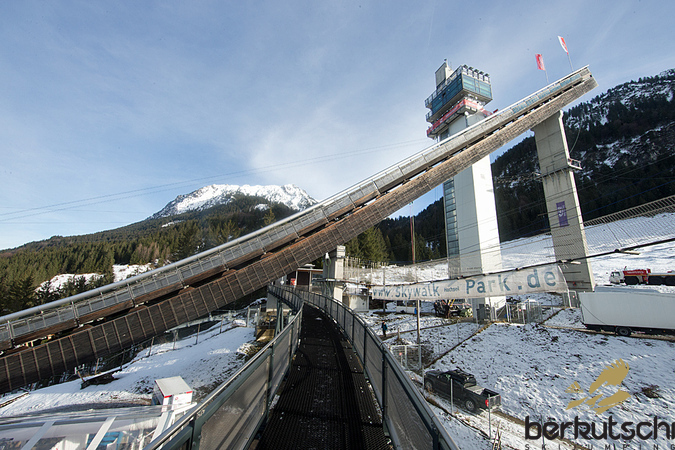 The second edition of the column "Luis on Tour" continues at Oberstdorf, this time with a visit to the ski jumps at Schattenberg. 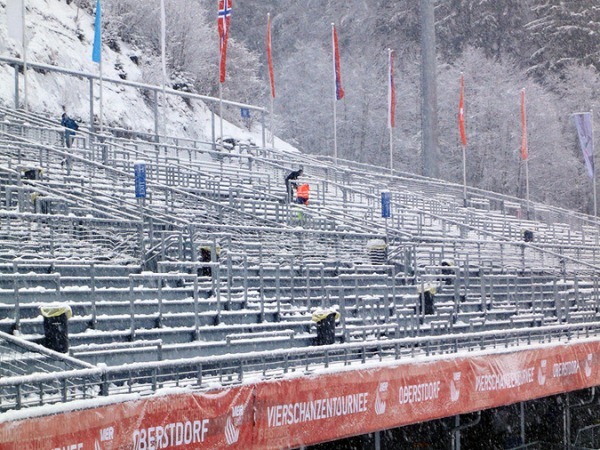 Die Kapazität der Arena liegt nicht bei 24.000, sondern bei offiziell 27.005 Plätzen, davon 1.337 Sitzplätzen. 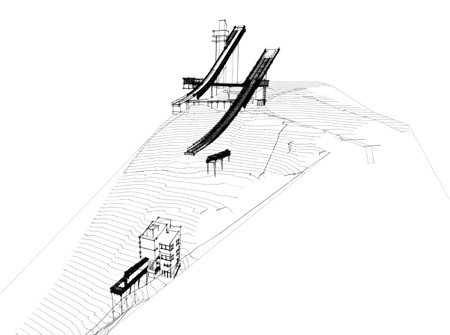 I'm looking for a full table Schattenberg hill record high since the inception of the hill. 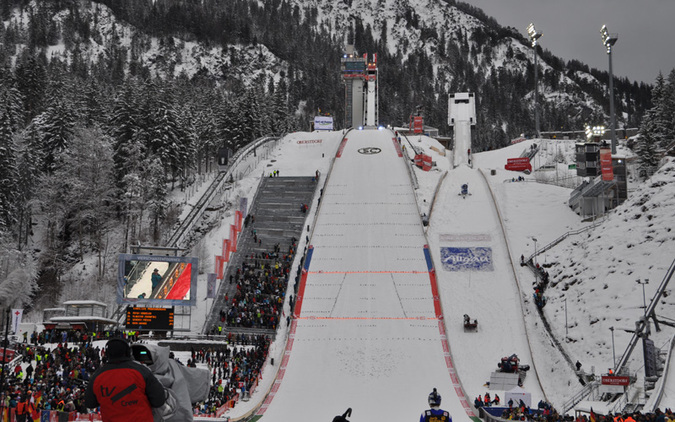 If, that table was still normal hill in Schattenberg, I would add would ask ..
104,0 m (Yuki Itō JPN, 24.01.2015, L-WC)???? 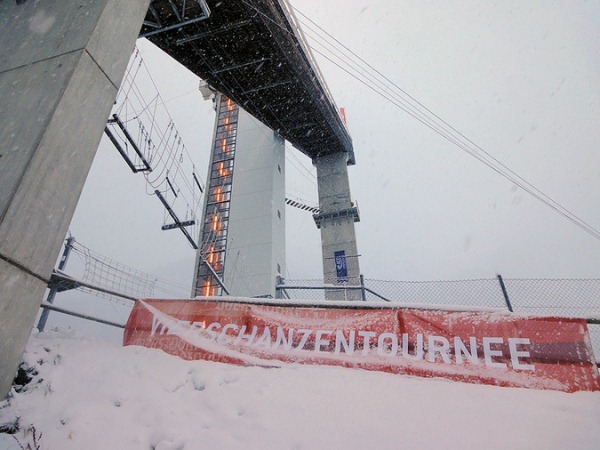 Der Schanzenrekord (Winter) ist falsch! 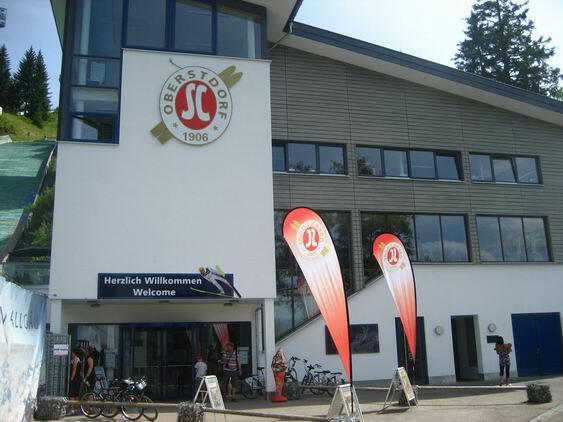 Sebastian Bradatsch (GER) sprang im Rahmen des DSV JOSKA Jugendcup / Deutschlandpokals am 11.03.2012 106,5 m.
Im Rahmen des Deutschlandpokals gab es am vergangenden Wochenende einen neuen Schanzenrekord. 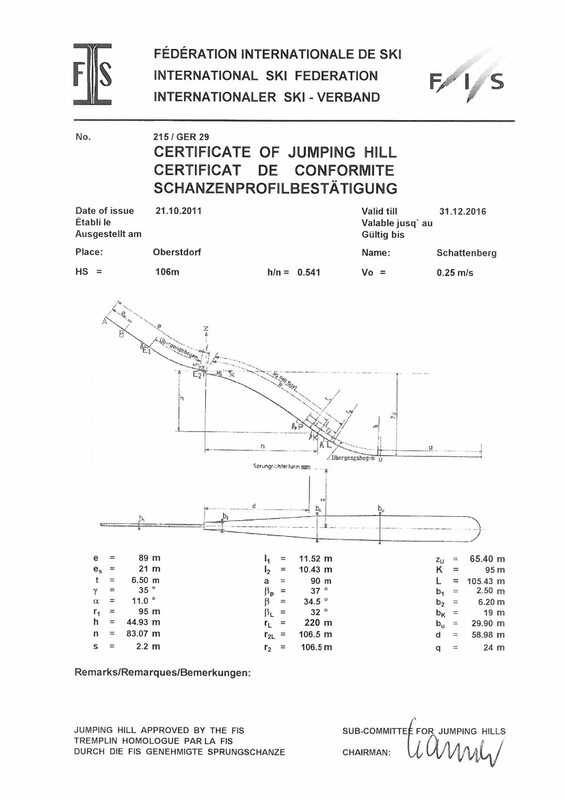 Tim Heinrich vom WSV Schmiedefeld sprang 107.5 Meter auf der Normalschanze. 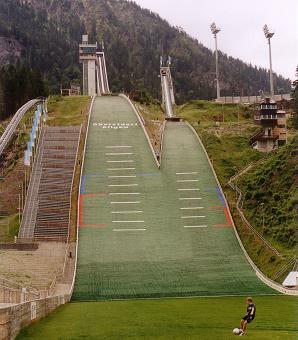 One hill record is missing. 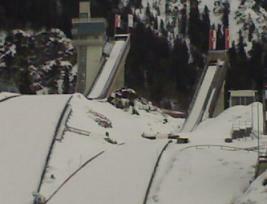 Pavel Ploc jumped 117 meters in 1987 during 4HT. 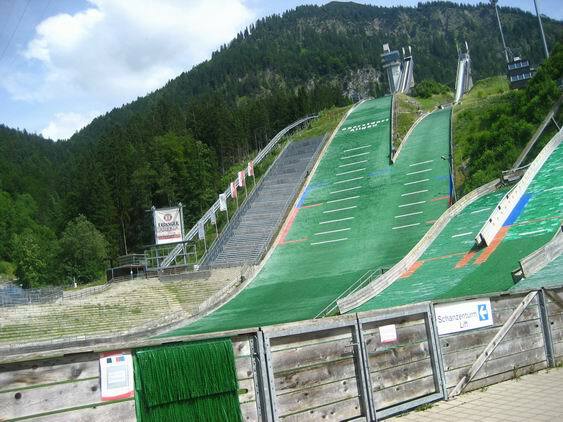 mam pomysł, pewnie nigdy nie wejdzie w życie ale mogę wam go przedstawić. 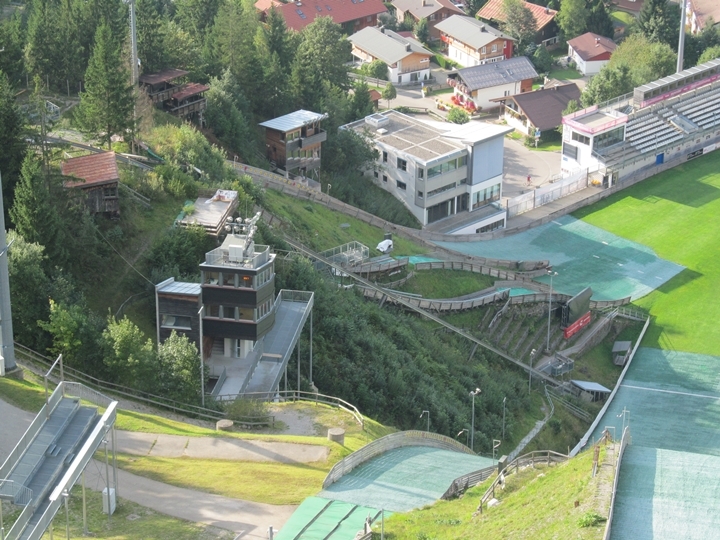 Co myślicie żeby w sezonie zimowym zrobić 3 dniowe zawody w Harrachovie lub Obersdorfie lub Planicy na skoczniach kolejno normalnej,dużej i mamuciej. 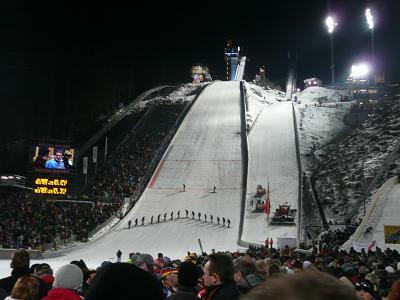 To były normalne zawody tylko tak na różnorodnych obiektach. 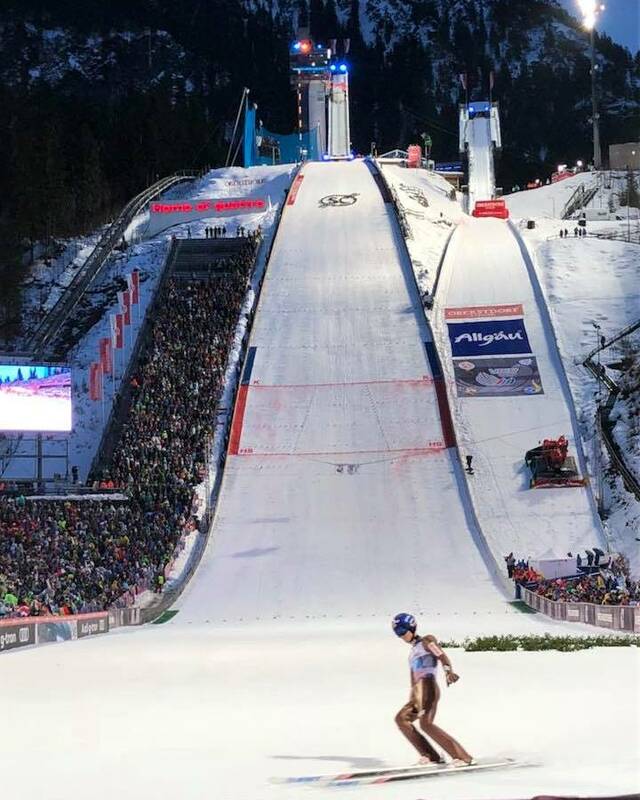 Es gibt einen neuen Rekord auf der HS 60! 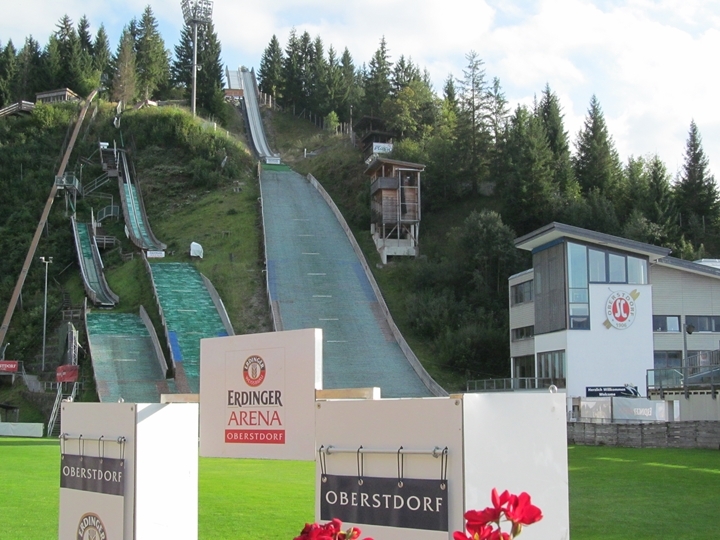 Der Österreicher Clemens Leitner sprang am 02.09.2011 beim FIS Schüler-Grand-Prix der Nordischen Kombination 60,5 m. Damit übertraf er die alte Bestmarke des deutschen Sven Kühn um einen halben Meter. 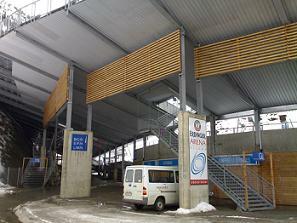 Its needed, because the old one wouldnt get a new fis certificate! 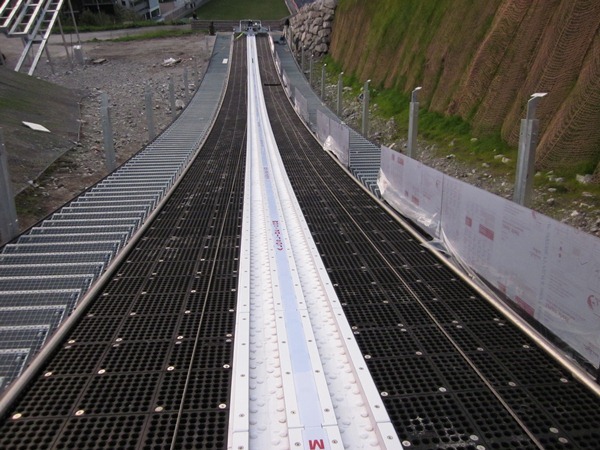 Die HS 100 soll m Sommer zur HS106 umgebaut werden!